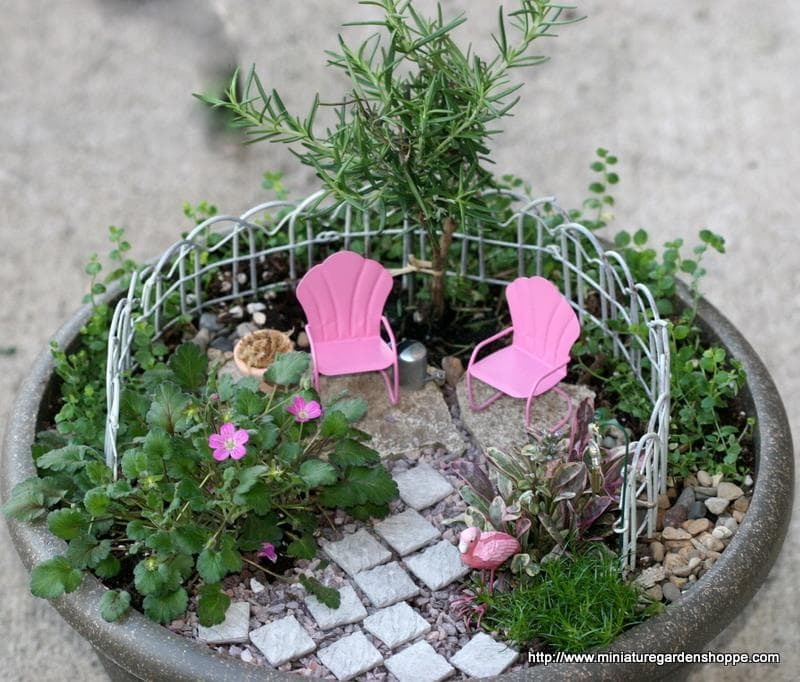 Looking for ideas on how to make your perfect miniature garden? We've included a number of ideas and examples to help get you started. 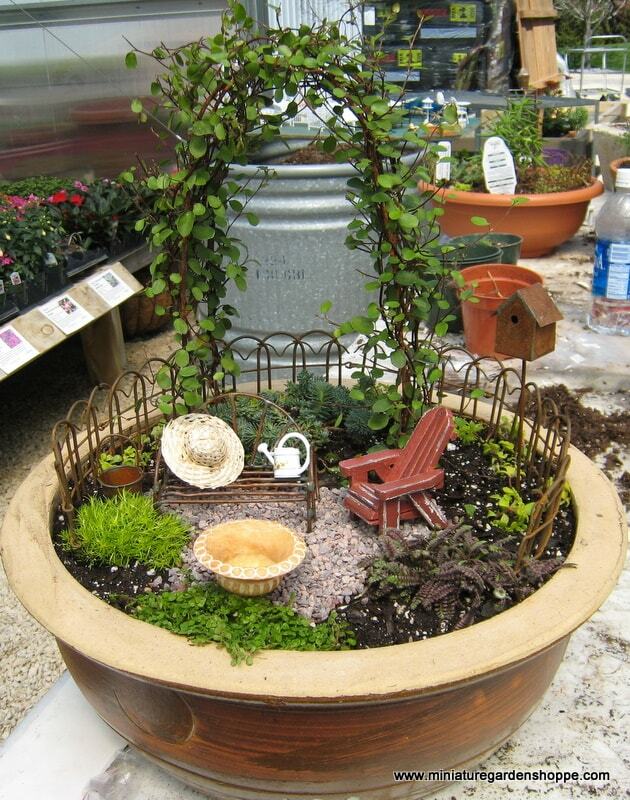 If you'd like to share your own ideas and gardens, please send a note to Kathryn at sales@miniaturegardenshoppe.com. 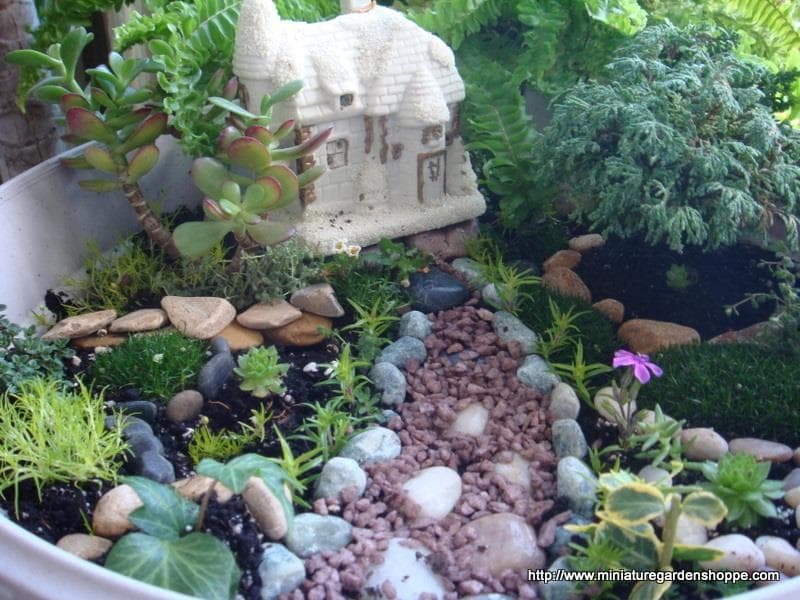 A fairy garden in the ground affords the space to use full-size or mature plants. Including a few plants with tiny leaves helps to relate to the scale of the houses. 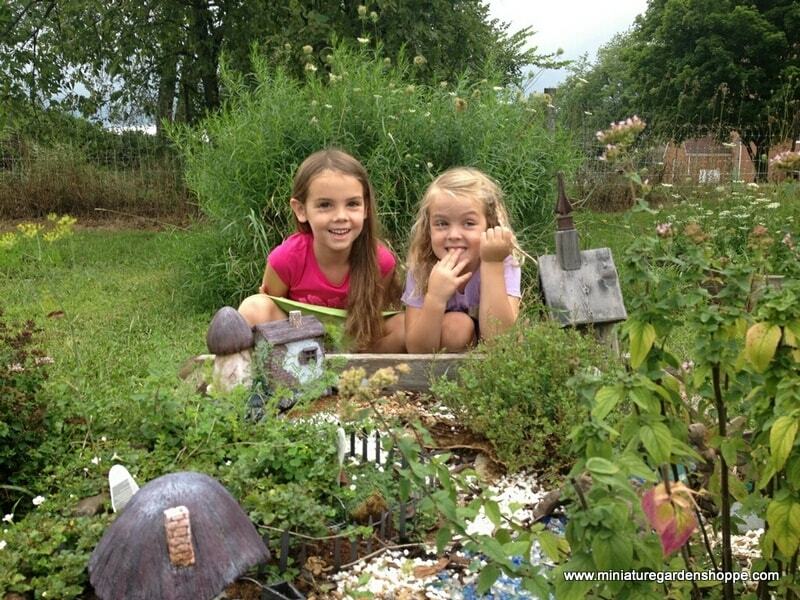 This fairy garden is planted in a raised bed - a wooden, bottomless box set on the ground. 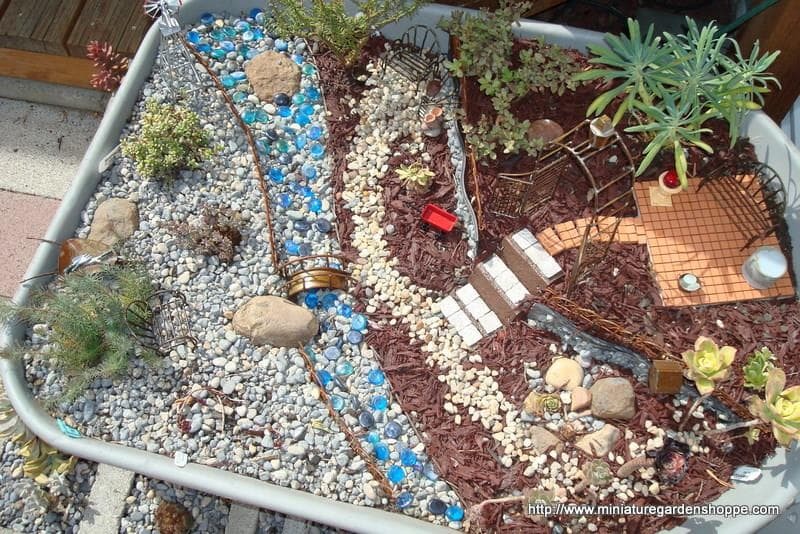 The stream and path carry the eye through the garden and connects the different scenes. 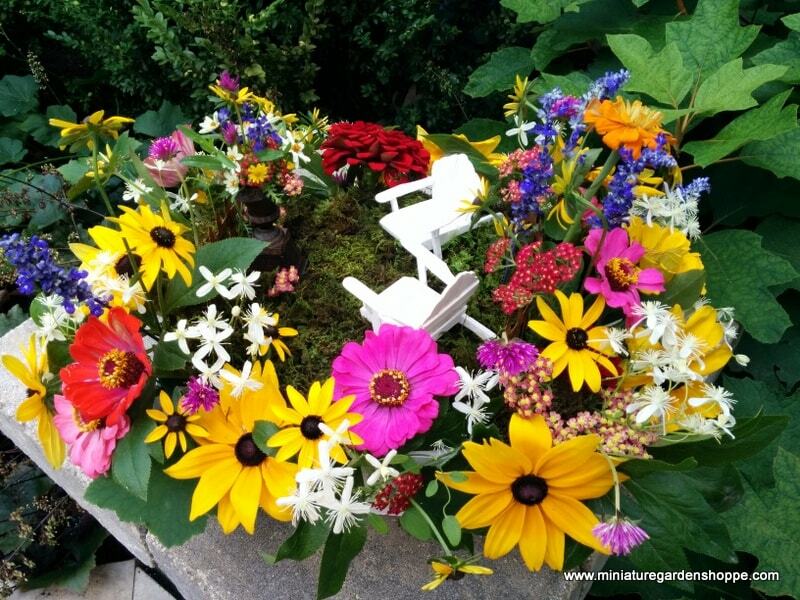 Summer centerpiece with cut flowers from the backyard and a miniature landscape scene inside. I love the juxtaposition of the big "life-size" flowers and the miniature world within. 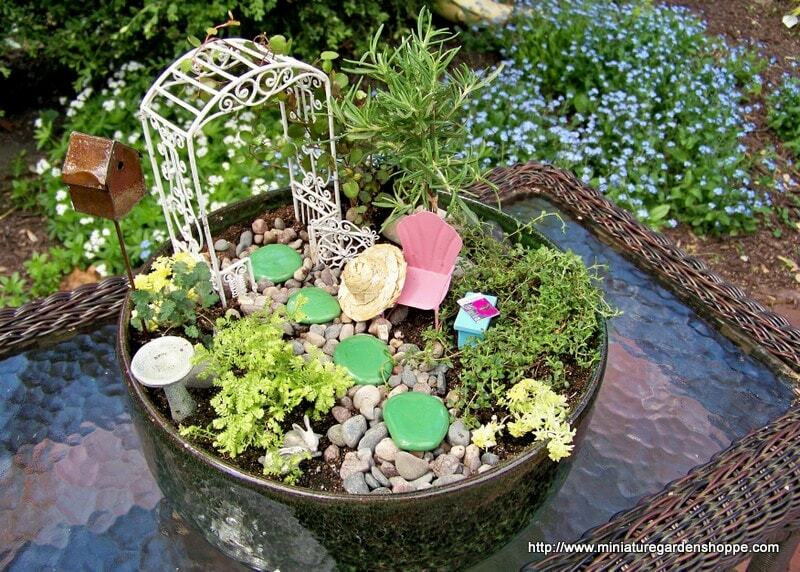 A fairy garden paradise. Close up of the fresh cut flower arrangement in the Antique Urn and Pedestal that sets across from the chairs in the garden. Flowers include Zinnia linearis (white), Dahlberg Daisy (yellow), Gomphrena 'Fireworks', and bits of Achillea (orange) and Salvia 'Victoria Blue'. 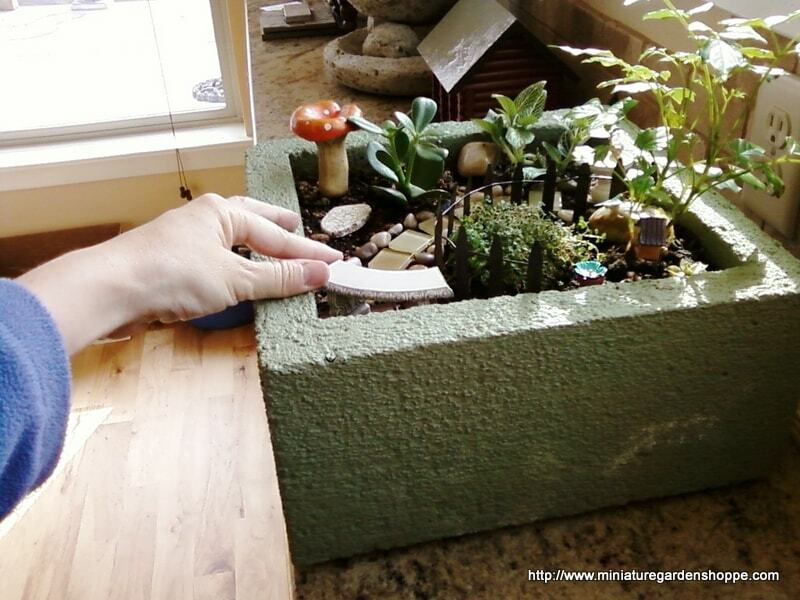 Miniature gardening makes you see things from a different perspective. The flowers of Rudbeckia fulgida var. fulgida look like miniature sunflowers when cut with long stems and positioned behind a miniature fence. The "lawn" under the chairs is preserved moss. 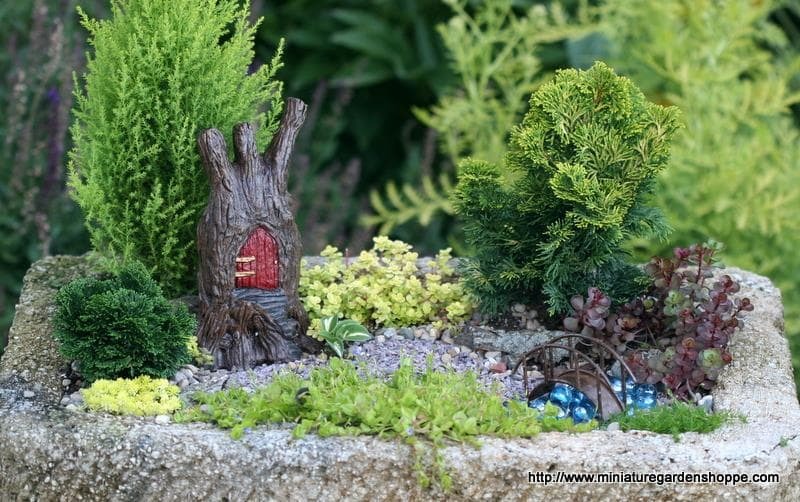 Miniature gardens and fairy gardens make great gifts! 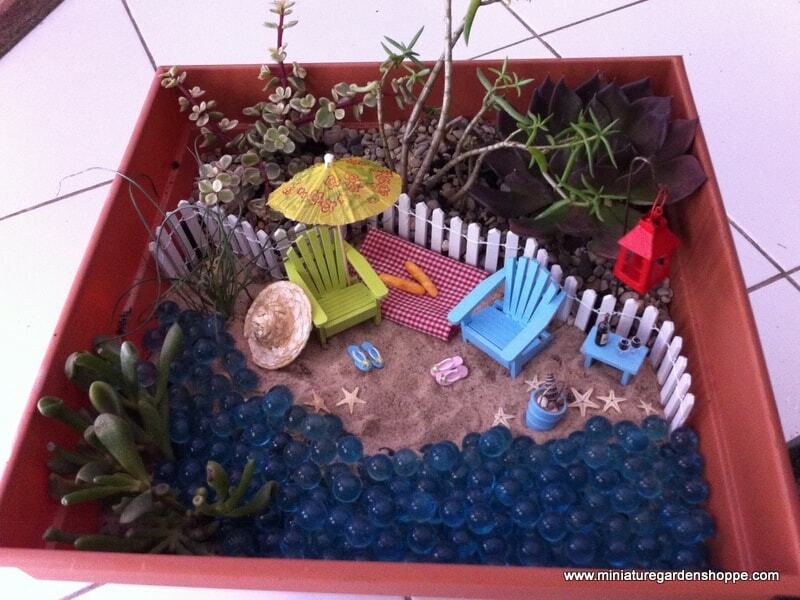 Rebecca Dieter made this little garden for a friend. 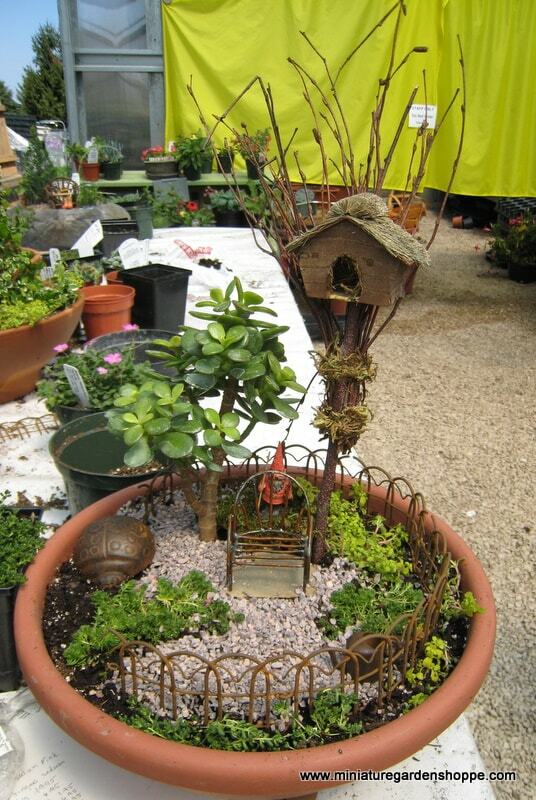 The tall birdhouse, with a variegated creeping fig, balances the large pilea, "Tiny Tears", in the opposite corner. The rustic vine bench is the focal point and touches of red tie it all together. A lovely design. 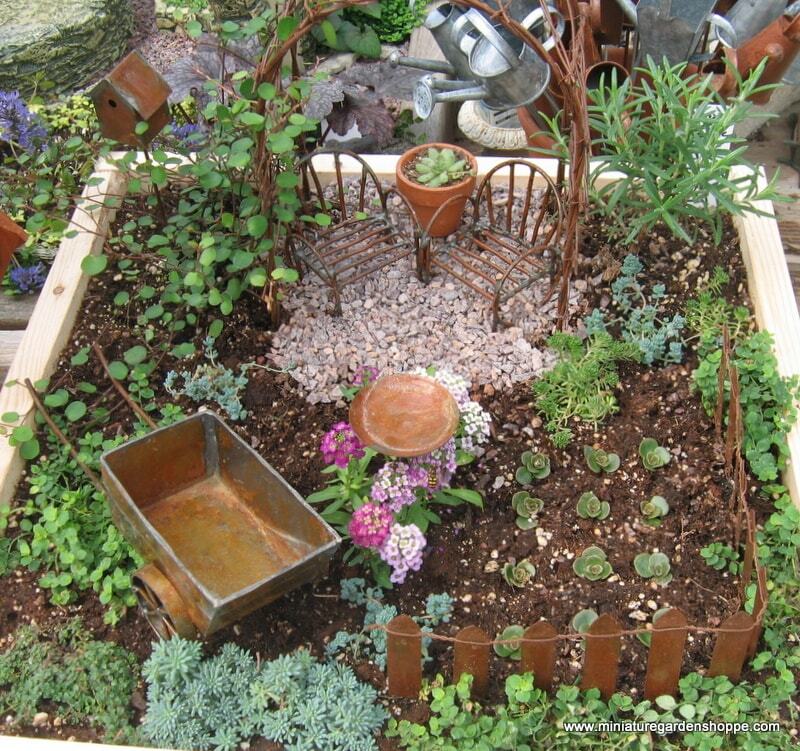 Great little garden by Gail Gildner. Love how the bright red chair stands out against the dark brown Chanticleer Potting Shed. Bit of red is picked up again in the windmill and on the tools. 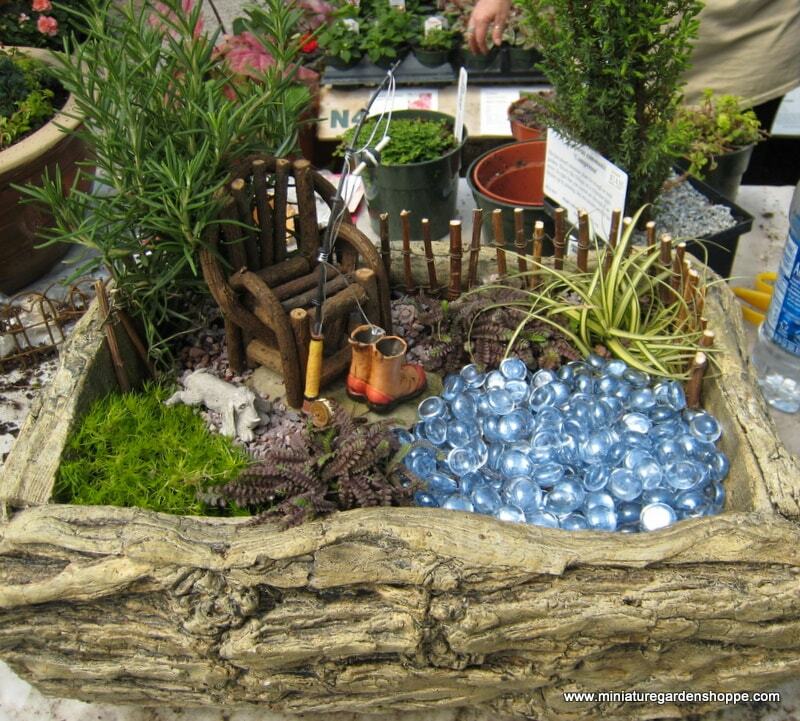 Very nice example of a container coordinating with the elements of the garden within. The side of the planter even reads, "Enjoy the Little Things"! 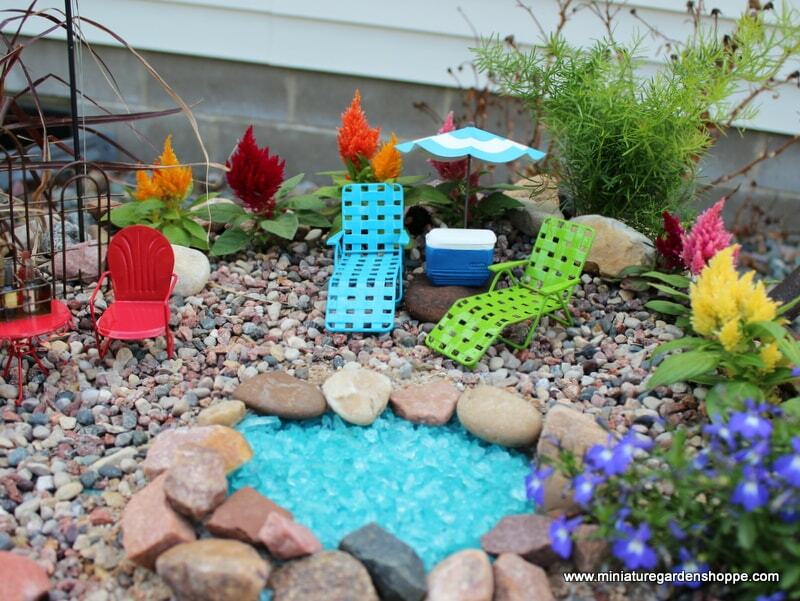 Bold beach garden by Barb Terrebonne. 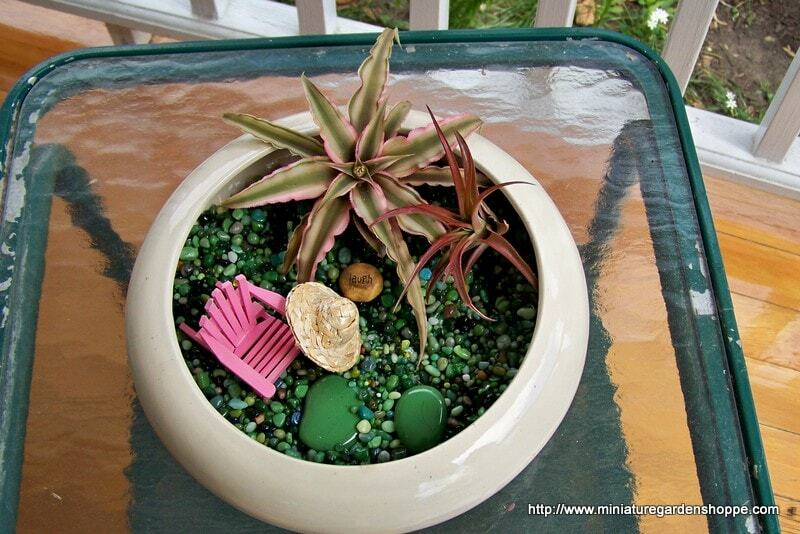 The aqua blue rim of the container gives it a tropical vibe and adds color to the scene. Note the use of the large flat stone behind the chair. It works as a backdrop to not only anchor the chair but to also make it stand out. It matches the boldness of the "water" and the plants as well. 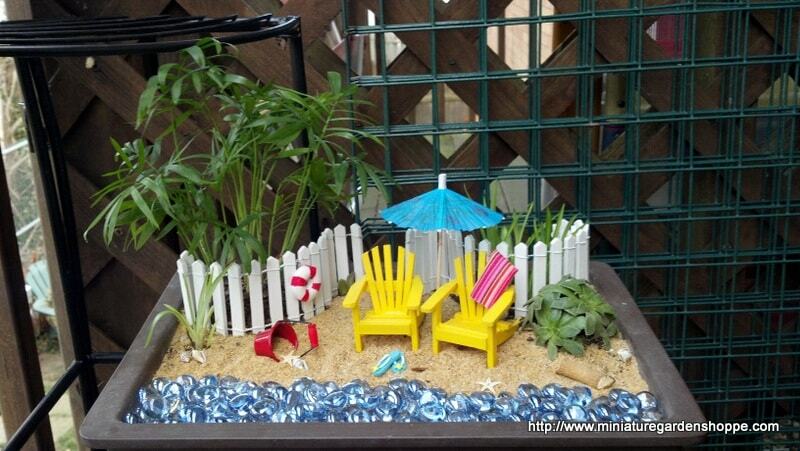 Award-winning miniature beach garden by Madison of Sharon, WI. Giant seashell planter is most appropriate. The inner curves create a natural visual rhythm, reminiscent of an ocean shore. Madison made her own tiki hut using a dried gourd for the building and raffia for the roof. Very creative! A garden with a view. 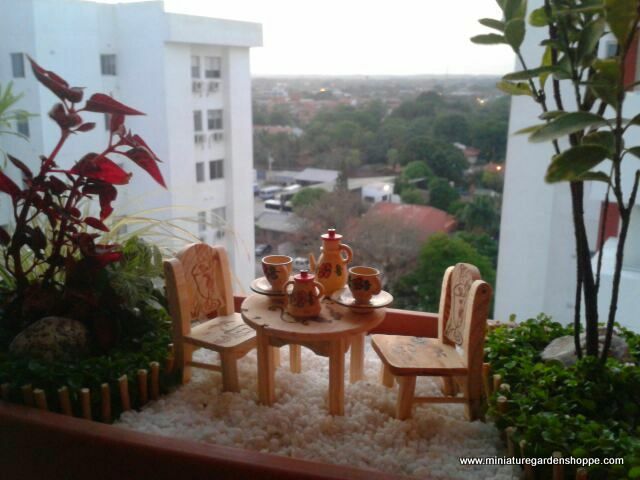 Claudia Gutierrez created this pretty little garden in a window that borrows the view outside. Notice the "tree" on the right side of the garden, created by removing the lower leaves of a multi-stemmed plant. The rock "boulders" are lovely nestled in the groundcover. Beautiful! 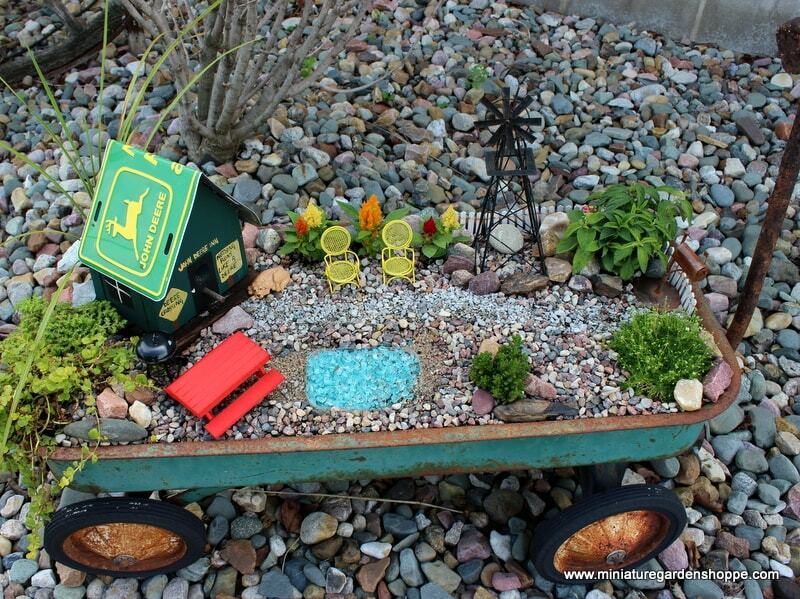 Wonderful colorful miniature garden in an antique wagon, by Durelle Zacharias. Take a minute to find all of the color echoes (i.e. black in the windmill, grill, and wagon wheels). 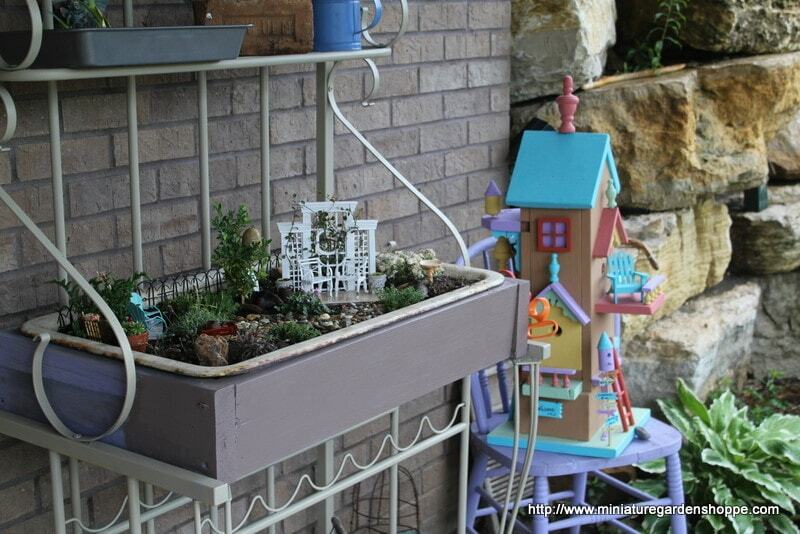 Note the use of a birdhouse as a miniature garden building / fairy garden house. Fabulous fun! Another garden by Durelle Zacharias with the same great use of color. The celosia in the background is perfectly placed to not only provide a backdrop and color for the garden, but is also positioned so that it (and the other plants) can grow in size without disrupting the design. Love the color echo of the picnic cooler with the blue lobelia in the foreground. 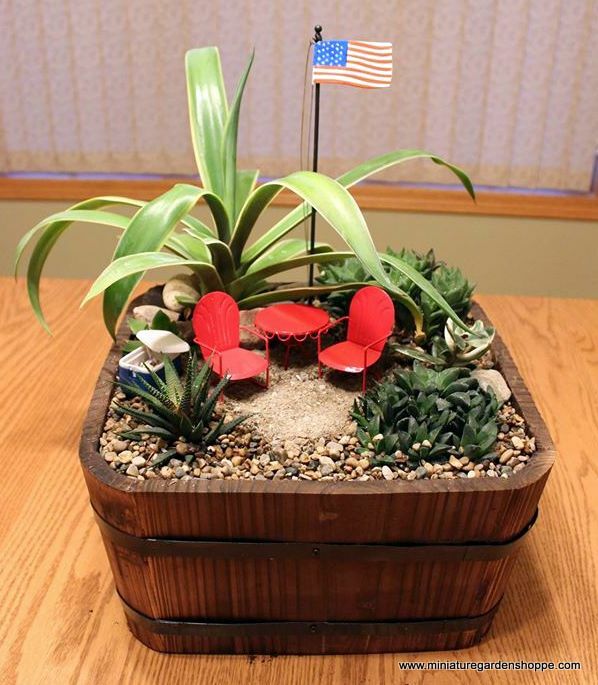 Durelle Zacharias made this little garden for a silent auction and named it "Have a Cold One". Naming your garden declares it a unique creation and a work of art. Every garden - no matter the size - deserves to be named! 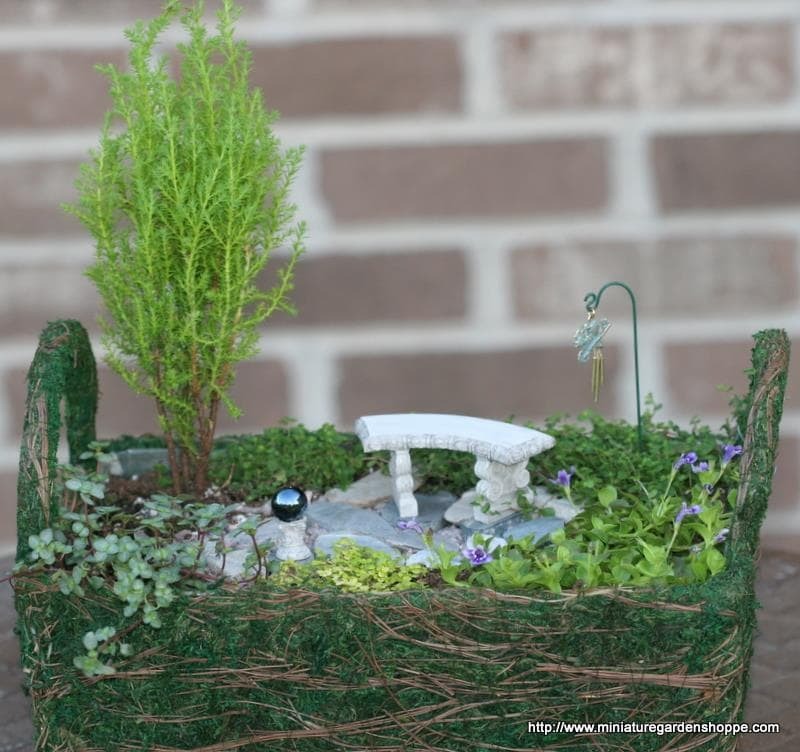 A welcoming miniature garden, by Aurelia Campbell, in a whimsical planter. 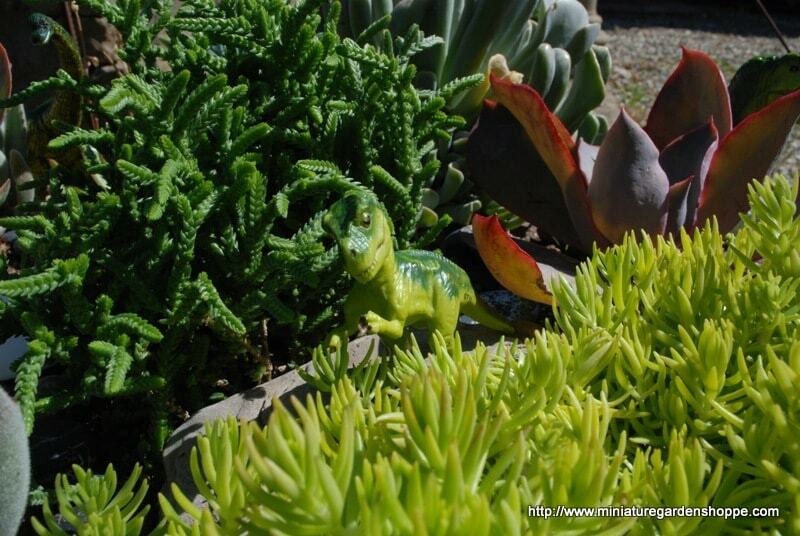 Standing frogs are not only fun and eye-catching, but they hold the garden up to be readily seen and appreciated. The gray stone pathway echoes the color of the frogs and unifies the scene. 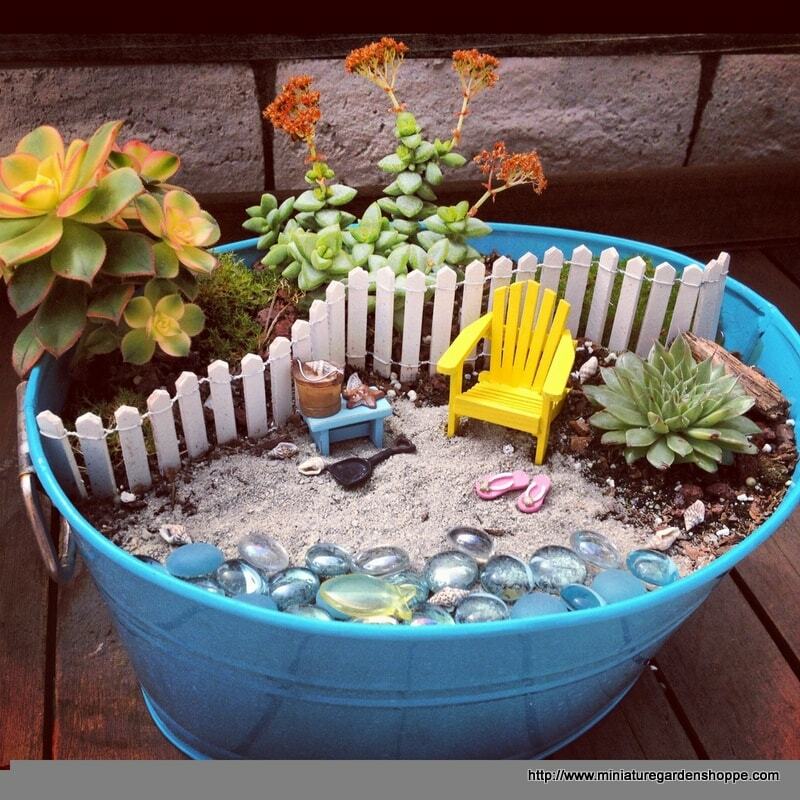 Fun and functional beachside garden by Rebecca Lopez. A white picket fence separates the beach from the wild garden beyond. It also separates the sand beach from the rock around the plants. 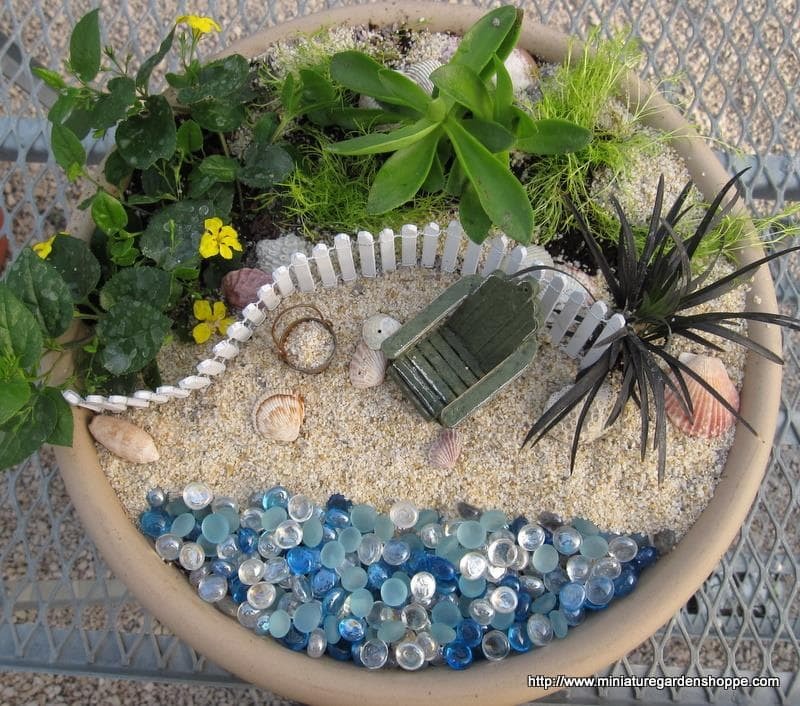 Keeping the plants in the rocks makes watering and maintaining the garden easier, as it keeps the sand clean and undisturbed. 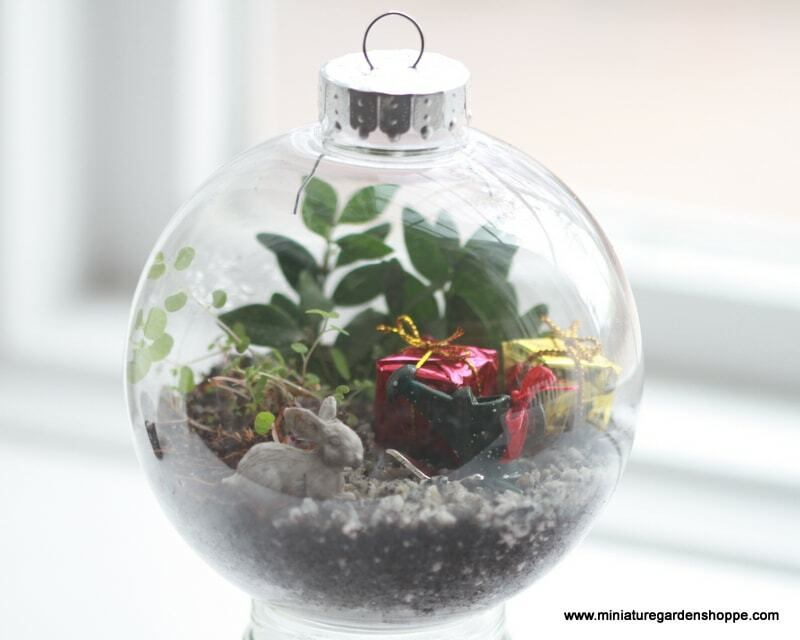 A tiny miniature garden inside a clear plastic ornament is an exercise in patience! 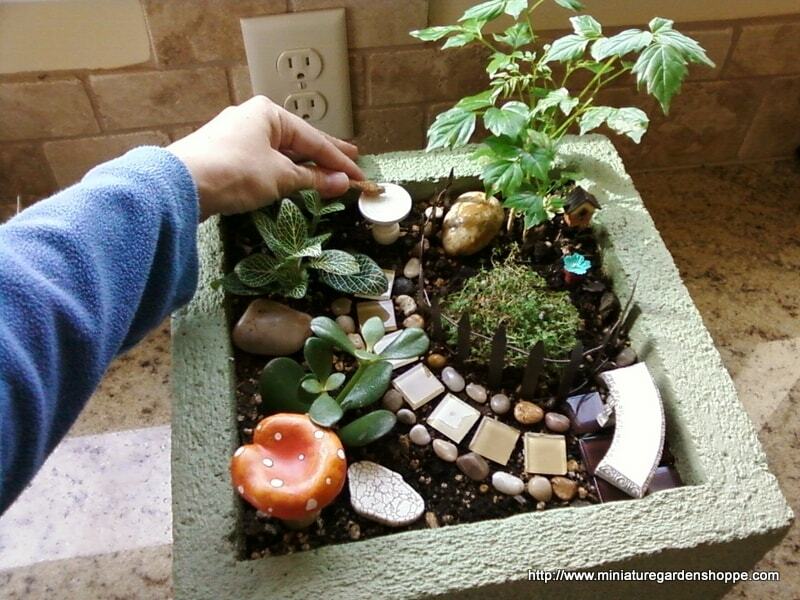 Just like a regular terrarium, has a little gravel in the bottom then a few spoonfuls of potting soil. The baby tears are growing happily and the dark green leaves in the background are boxwood cuttings. Once the baby tears gets big, the boxwood will come out. Each little accessory is attached (glued) to a short stake to keep it in place. Would last for a day or two on a Christmas tree, but would then need a nice bright (not direct sunlight) place to grow. 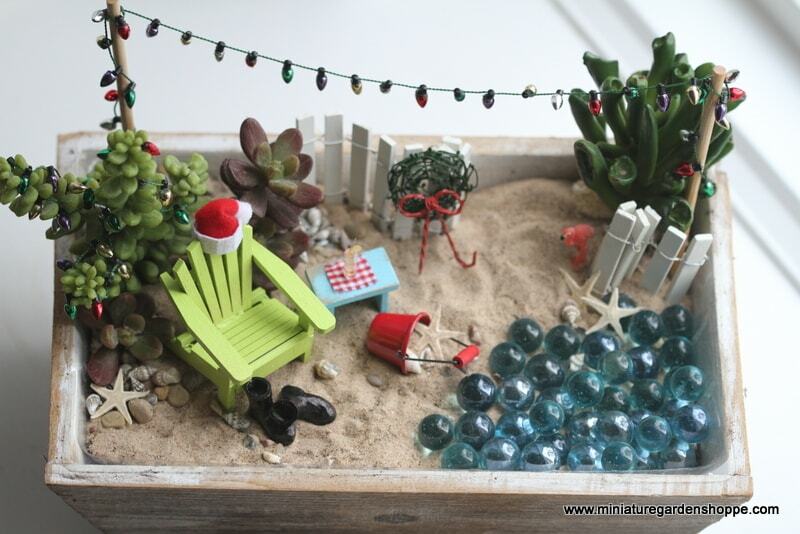 A little tabletop Christmas garden. 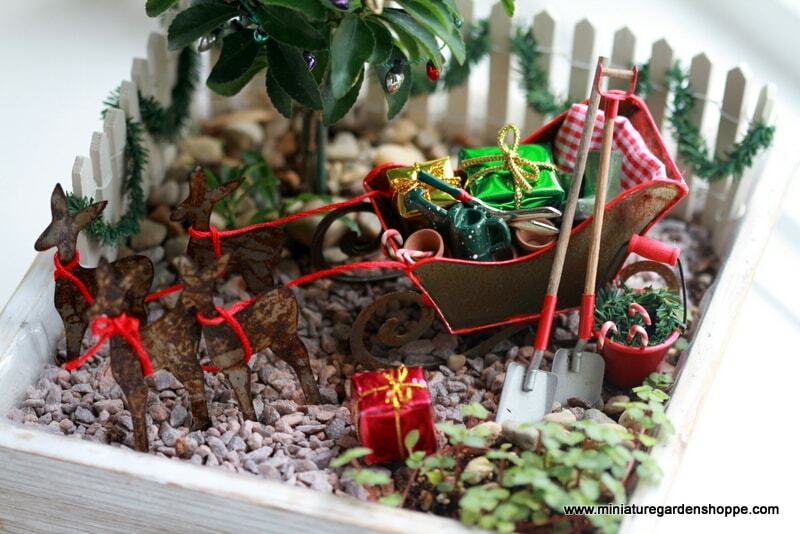 The square planter is just big enough to hold the sleigh and four reindeer. After the holidays, it can be removed and replaced with a garden bench for spring. Red embroidery floss is used to make the reins and miniature Christmas lights decorate the tree. 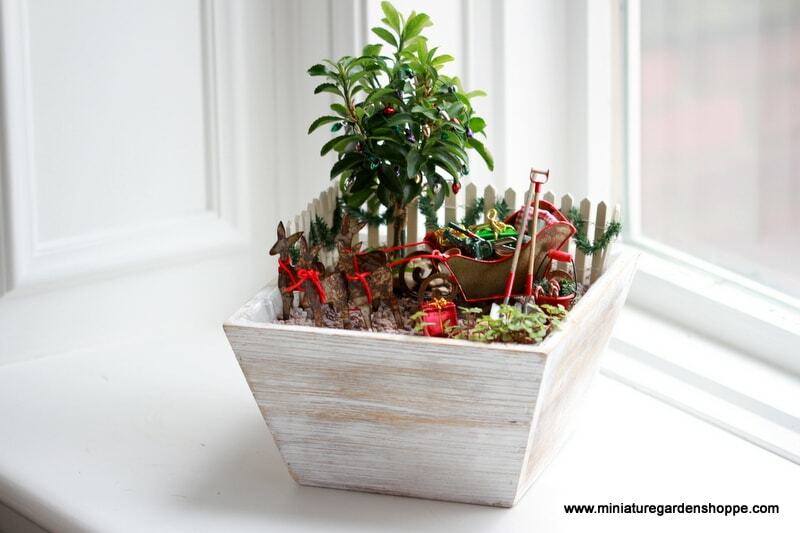 Miniature faux evergreen roping is a versatile Christmas decorating accessory. Here we used it to cover the top of the bucket and hide the foam inside that holds the candy canes. When hanging the roping as garland along a fence, be sure to make the loops of equal length for the prettiest effect. Sometimes it's okay to go faux. The succulents in this little garden are all plastic! 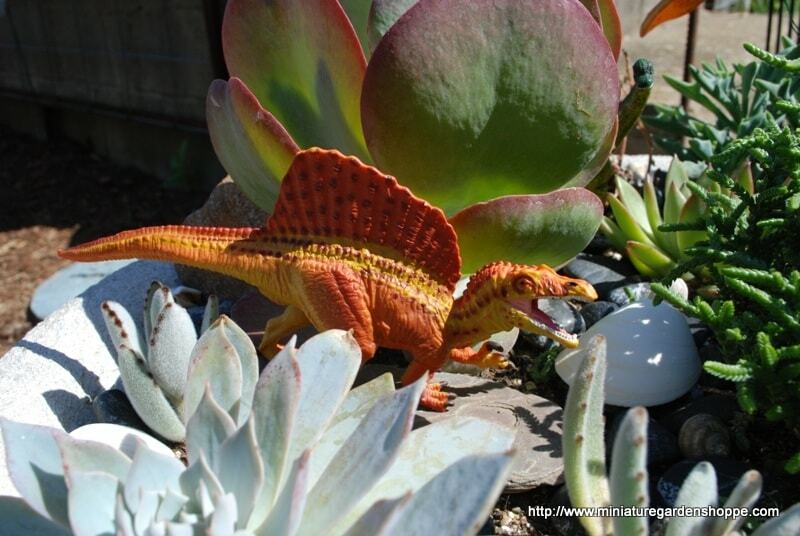 If an artificial botanical does justice to the real thing, it can be a wonderful tool. If it looks fake, then the magic of the garden disappears and the artificial plants become a distraction. Notice how the sand is piled up in places, giving the beach a more natural look. Hanging miniature Christmas lights across the back of the garden gives it a festive look and visually ties it together. The posts are at two different heights to match the casual scene and to help balance the asymetrical design. Santa's boots are just a pair of green work boots, blackened with a Sharpie marker. Sometimes subtle is nice. 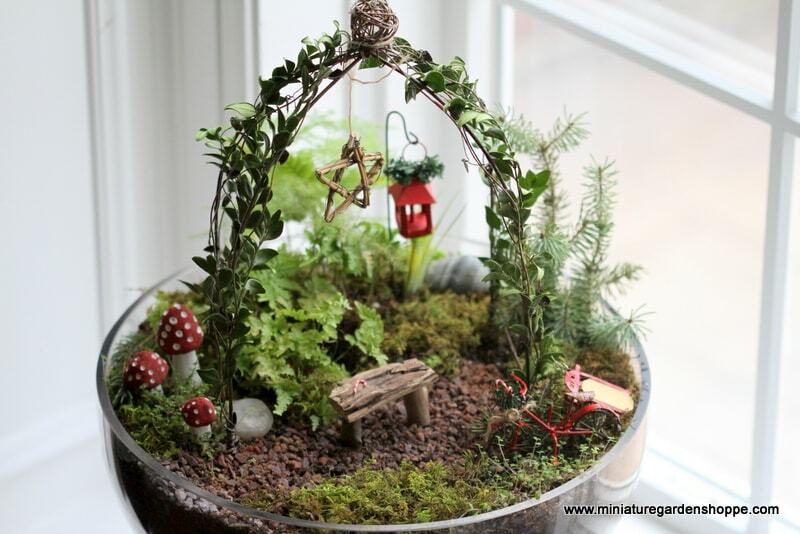 This little fairy garden has a few red accessories that create a holiday feel when combined with the greens of the garden. Boxwood sprigs are entwined in the arbor. A cutting from my spruce tree outside makes a nice little evergreen to fill in the space on the side. Both the boxwood and the spruce will last for several weeks in the moist soil. Once they begin to drop leaves/needles, they can be replaced with new cuttings or new plants can be planted in the garden. 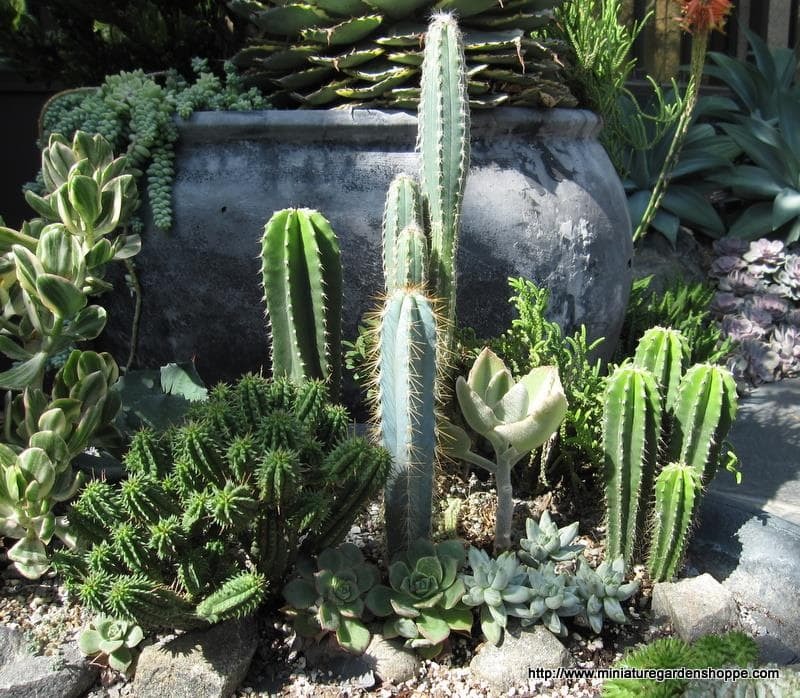 Using cuttings is a good way to temporarily fill in a space in a garden until you can get the plant that you want. 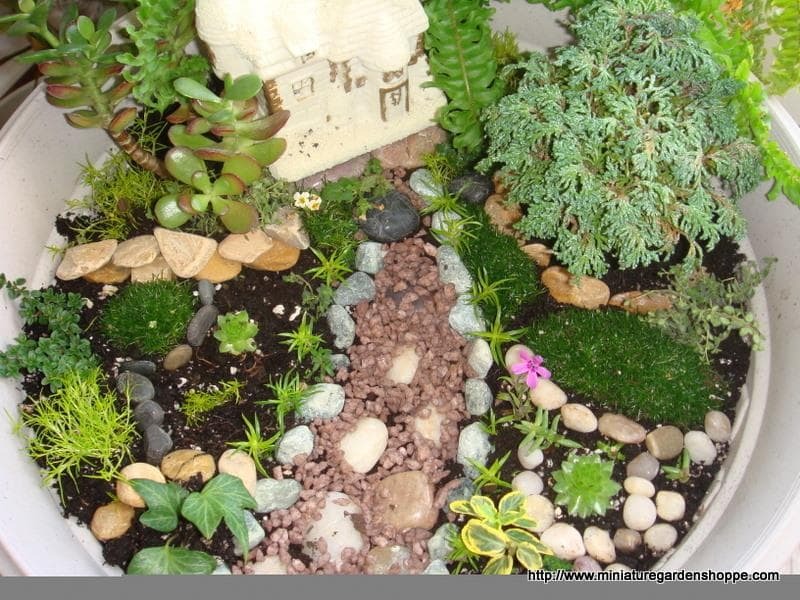 What they thought was going to be a formal garden, turned into a fun “Campground Garden.” Desiree’ Griffiths and her daughter created the scene complete with moss covered stick “logs” and flat stone “outcroppings”. The little votive candle makes the perfect campfire. 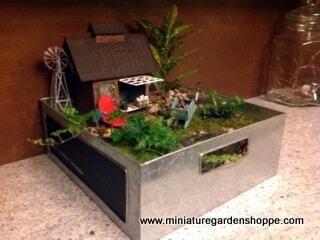 The long container allowed them to make three little vignettes which together create a peaceful little landscape. 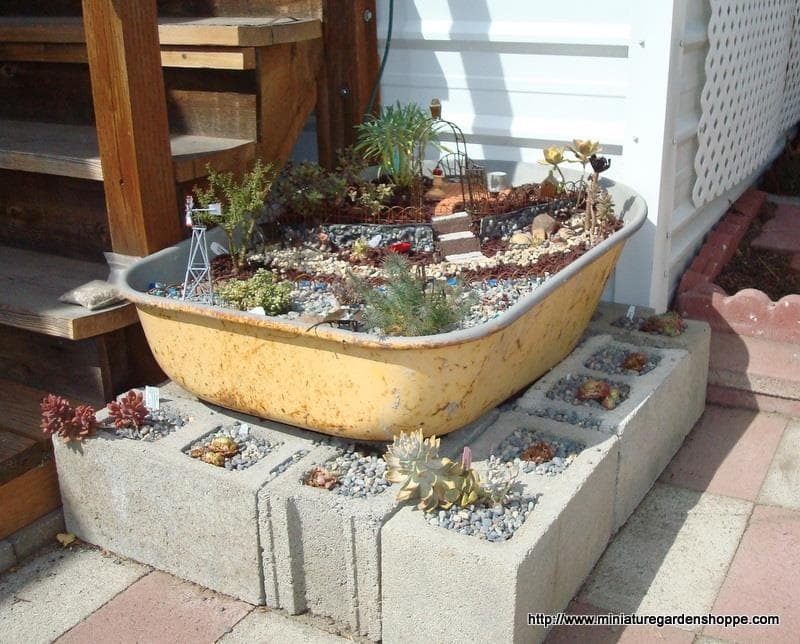 Shelly Skindelien created her miniature garden in an old cast iron sink and her husband built the frame to hold it. They placed it on the baker’s rack for easy viewing and care – a brilliant idea. The rack is under an overhang where the garden gets plenty of light, but is protected from heavy weather. Notice how Shelly uses a backdrop to set off each sitting area – the Jade “Princess Pine” behind the blue chairs and the white Moon Garden Trellis behind the white chairs. The stone path connects the separate areas of Shelly Skindelien’s garden and the repetition of the three Sedum ‘Mentha Requein’ gives the garden a sense of unity. 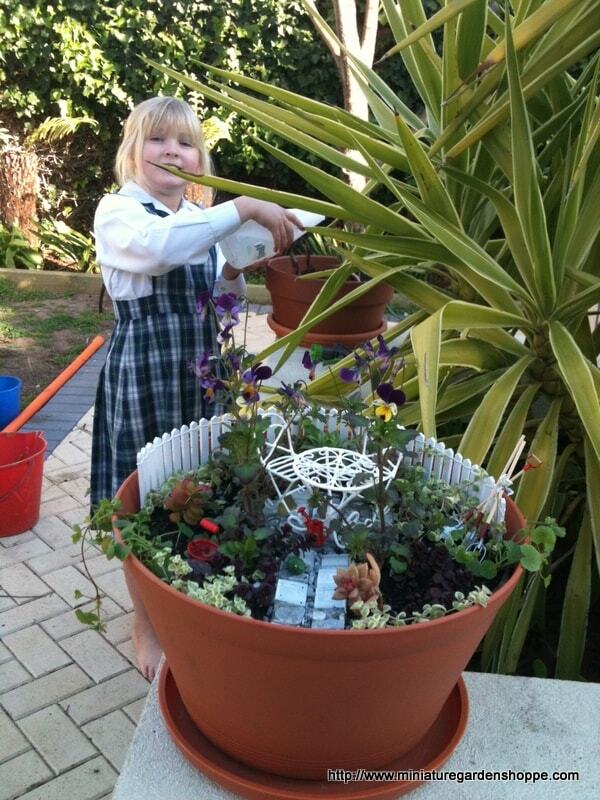 Award-winning Australian gardener, Ella (8), with her fairy garden. The bright white fence and furniture standout nicely against the deep greens of the garden and the terracotta pot. I especially like the eye-catching combination of the purple/yellow violas with the contrasting bright red accessories. 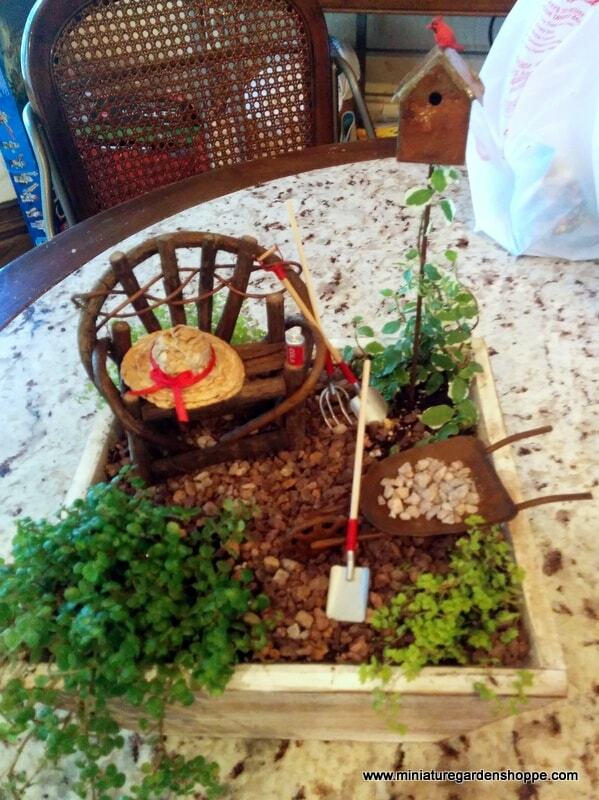 Mom, Eileen, told us Ella received 2nd place in the competition for her fairy garden. Way to go, Ella! 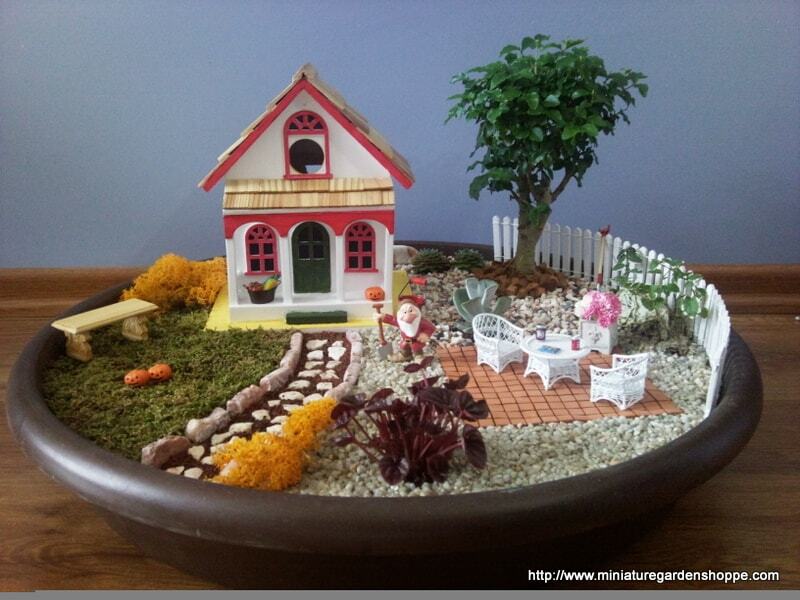 Having trouble finding an affordable house that suits your miniature garden? 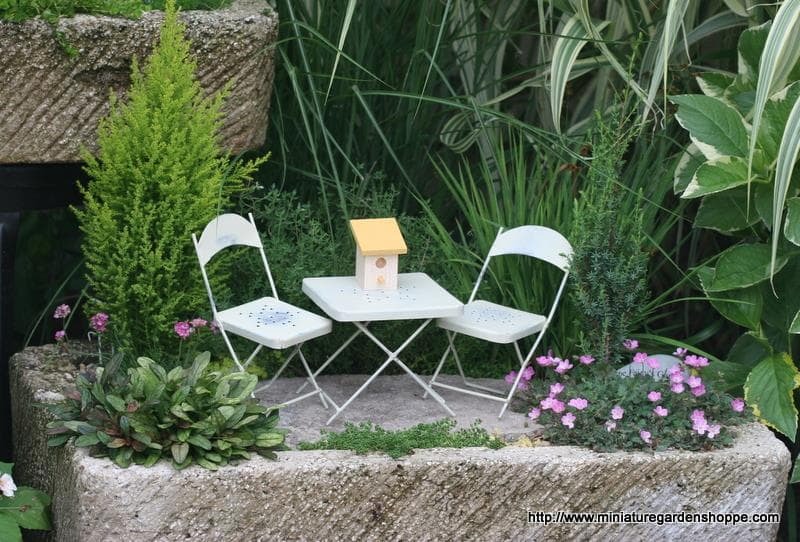 Try a decorative birdhouse, like in this garden by Ali Riza Yelsal of Turkey. Tufts of orange-colored reindeer moss look like shrubs and add more fall color to the scene. 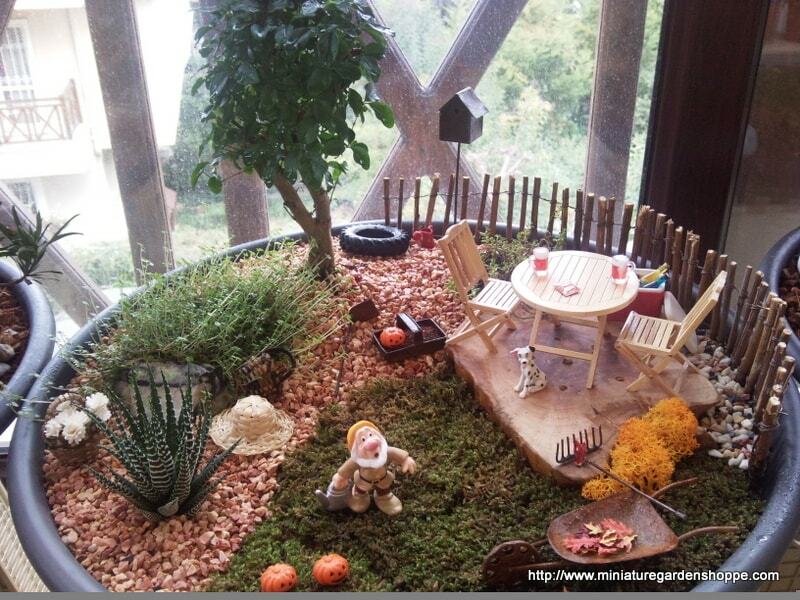 Aliz Riz Yelsal used a slice of wood for natural miniature garden patio. Florist’s sheet moss makes a great substitute for grass and can be sprayed green again once the color fades. Looks like a party!. 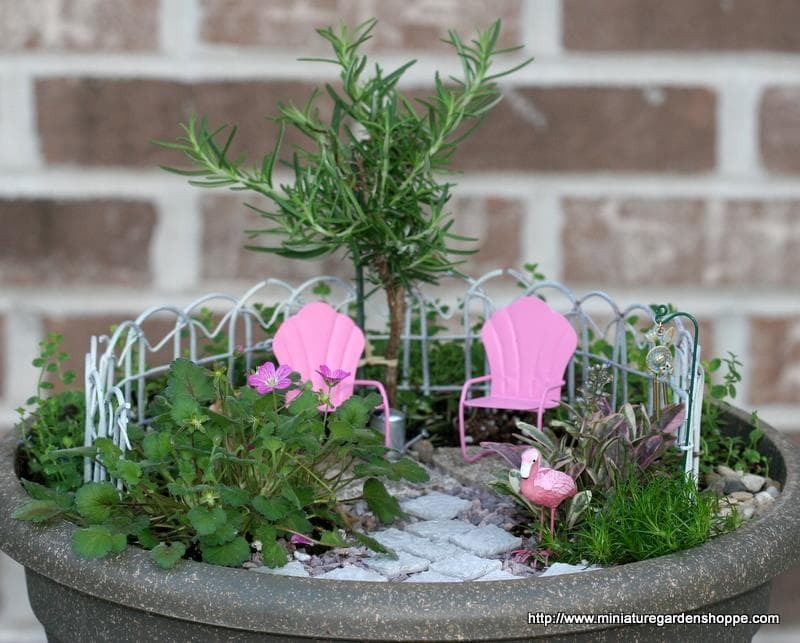 Charlene Staufer created this little garden in a cinder block-type pot that she stained light green. The shiny stones and steppers are laid in a pretty pattern, like jewelry for the garden. The creative layout makes for an interesting design in a very limited space. 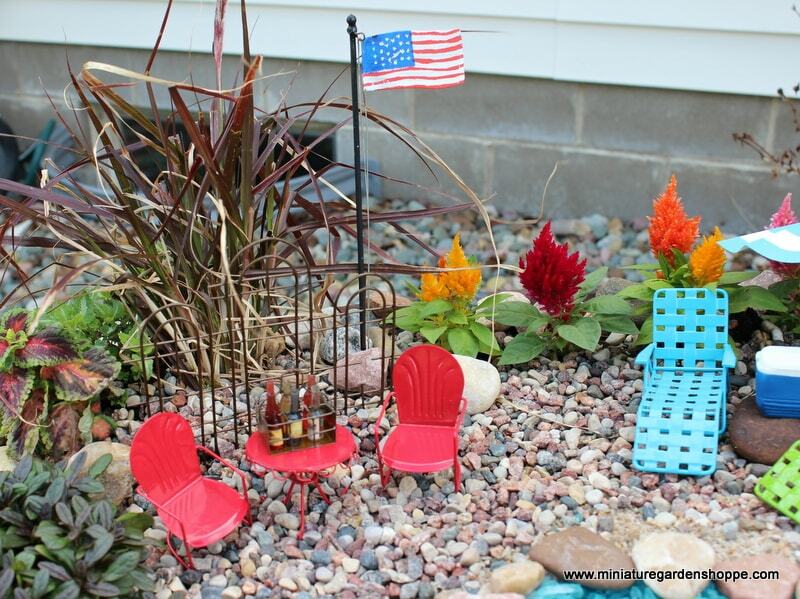 The whimsical orange mushroom plays with scale while adding color and contrast to the garden. It also balances the visual weight of the design, by Charlene Staufer. 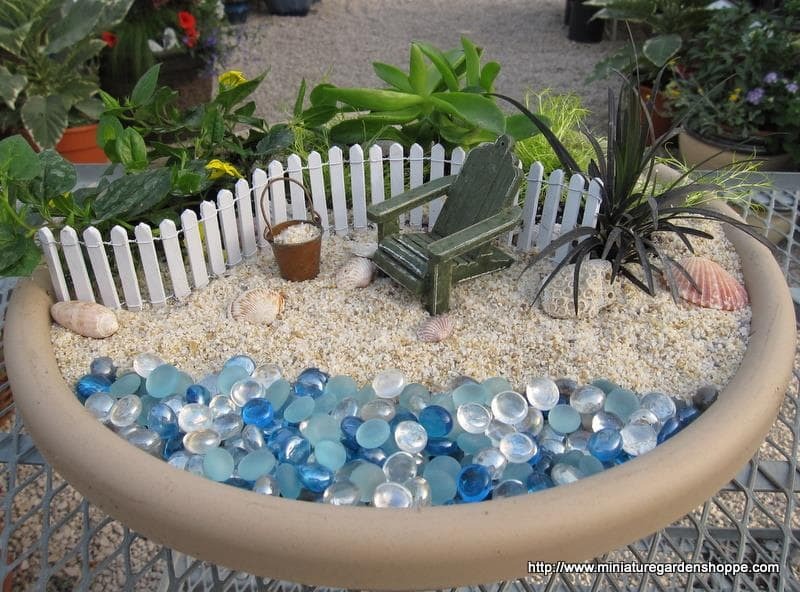 Another garden by Lona Pribble with Glass Pebbles and Glass Stepping Stones and air plants. Sometimes simple is the way to go. 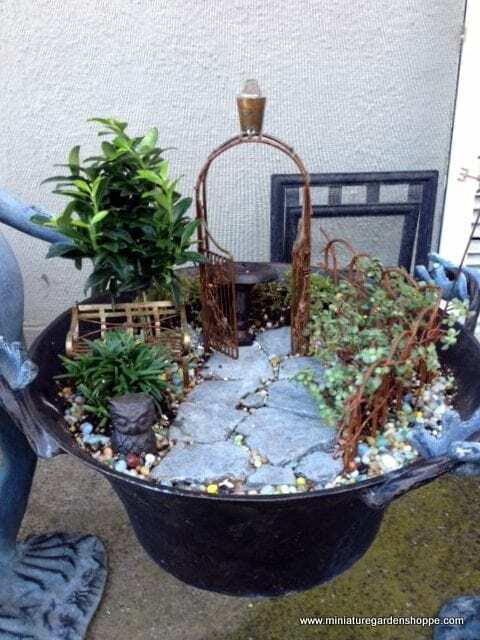 Created by long-time fairy gardener, Lona Pribble. 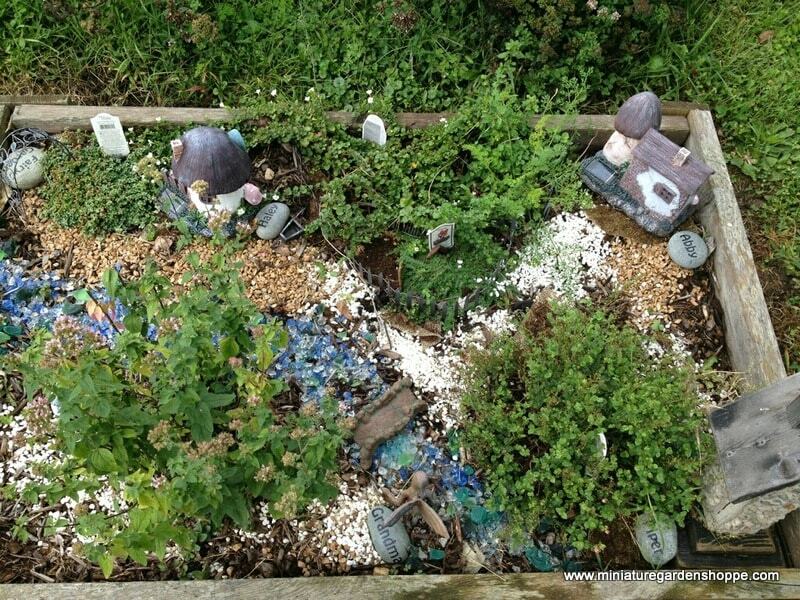 The Glass Stepping Stones add a touch of shine to the garden and help to attract the fairies. The yellow ferny Selaginella moved to another garden once the summer sun and heat got started. 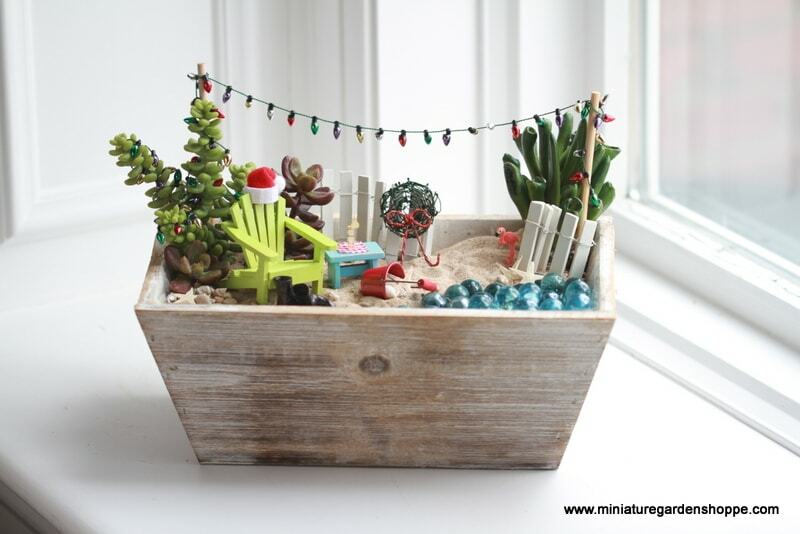 Succulent miniature garden by Lona Pribble. Great contrasting colors, textures, and forms. 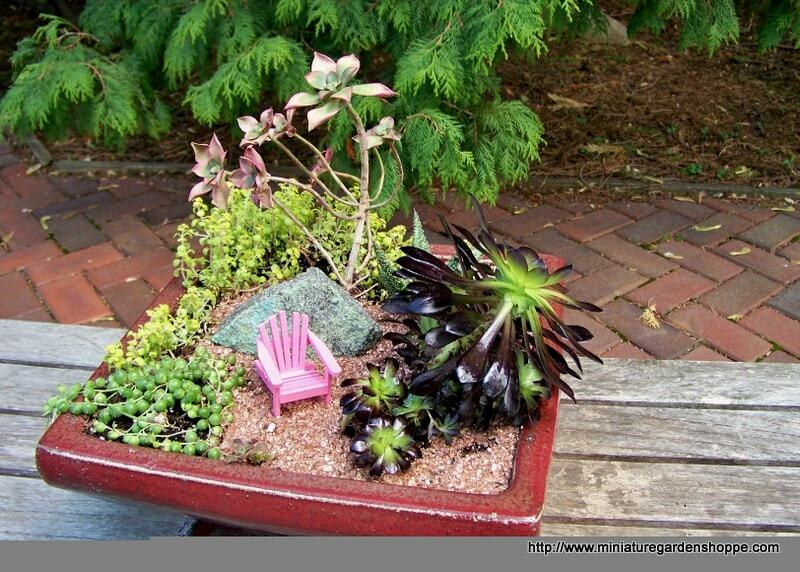 Note how the tall Aeonium is used as a “tree” and its pink color is repeated in the chair. 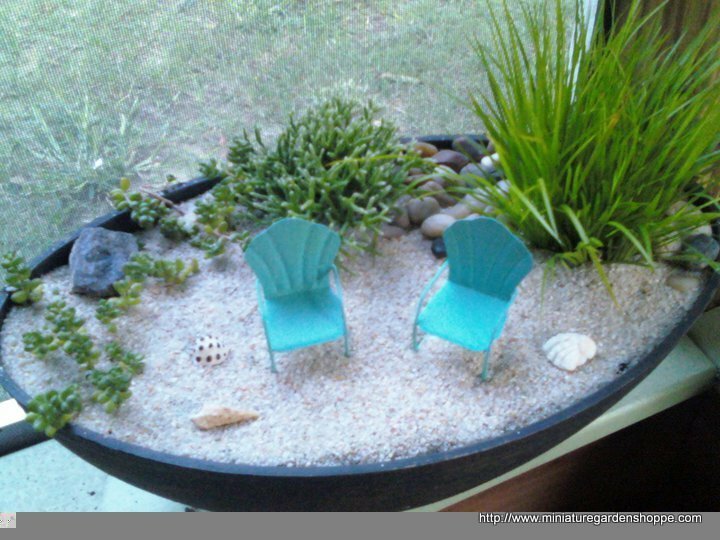 A lovely little garden in a window by Jackie DiPasquale. The Whistwood Bench is the focal point, facing the birdbath in the center of the garden. Just a bit of fence is all that is needed on the left to give a sense of enclosure and define the space. 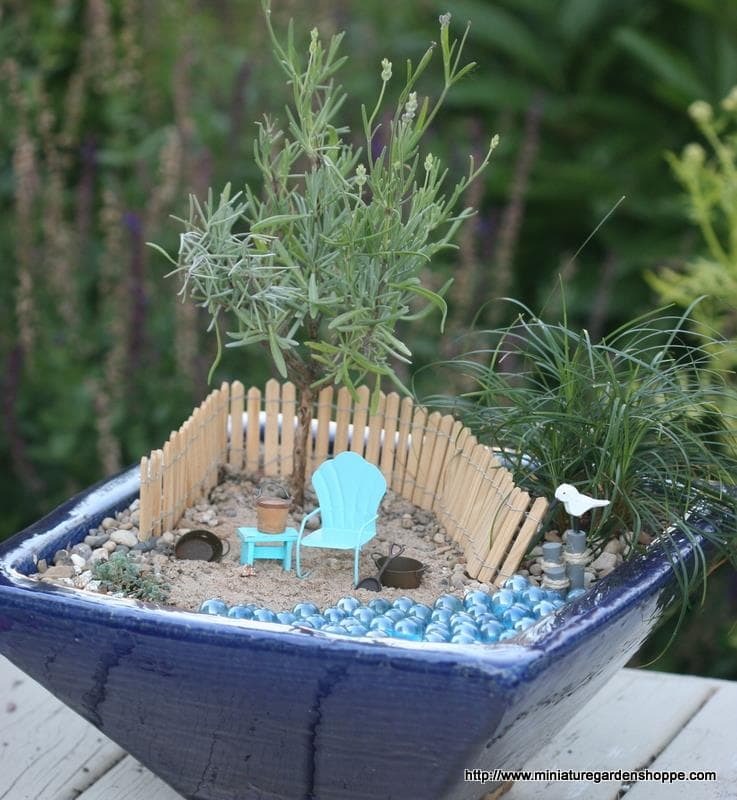 The rosemary “tree” adds height and is balanced by the Miniature Martin House on the opposite side. 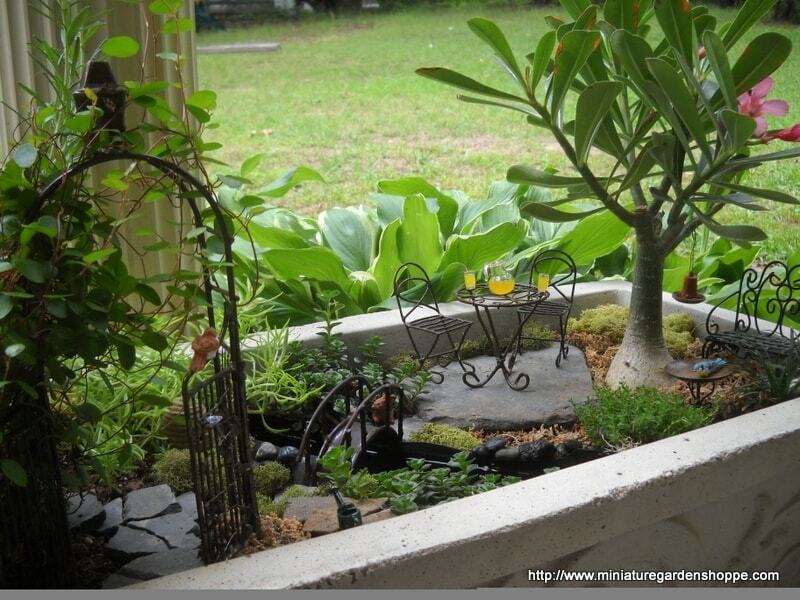 A beautiful miniature garden retreat. 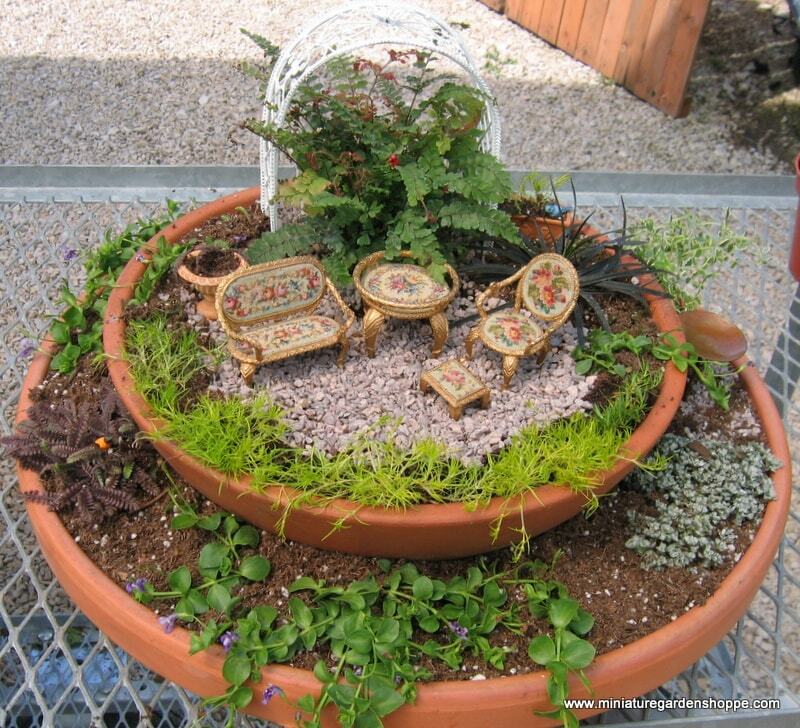 A charming little window garden by Suzanne Cannon. 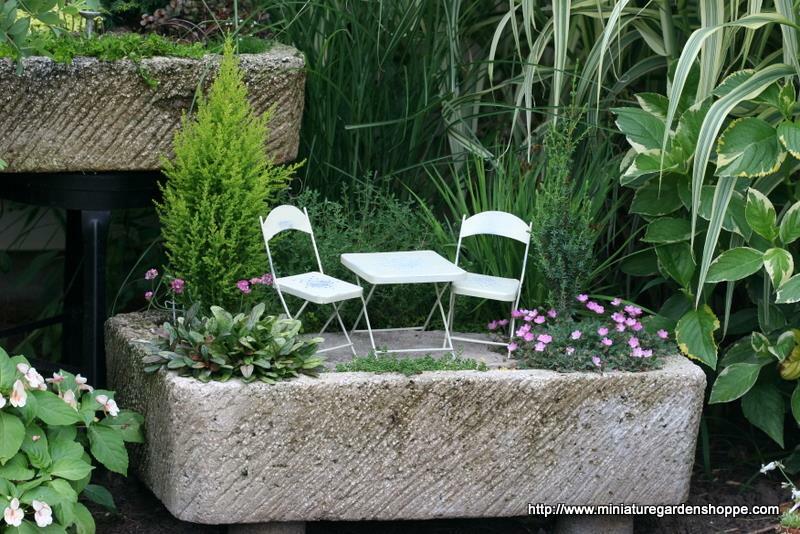 I like how the edge of the stone container acts like a seat-wall to enclose the garden. 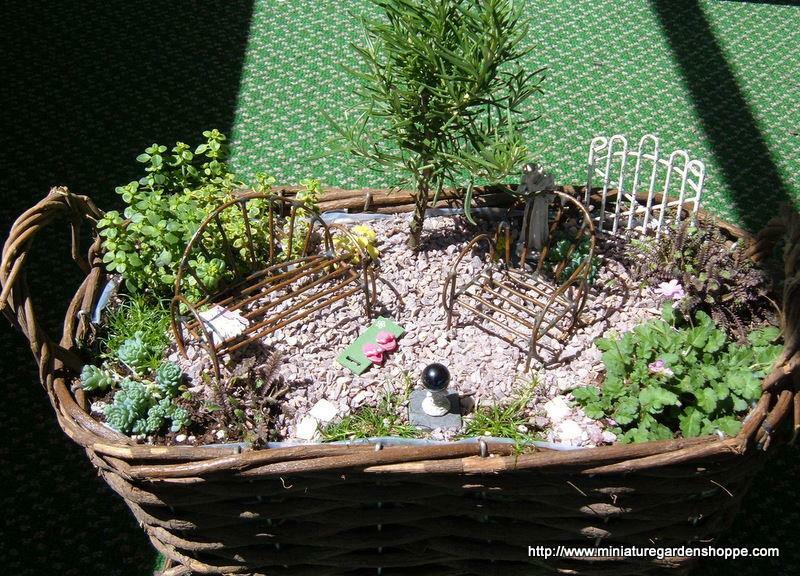 The little birds and bunny bring the garden to life. The lemonade set on the table looks so inviting, I’d love to be able to take a seat and enjoy the view from there. 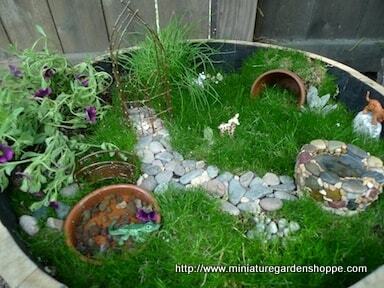 (by LeNore Murovic) It is a good idea to keep your miniature garden by a door or along a path. This makes it easier to keep an eye on your creation not only for water and maintenance, but also for daily enjoyment. 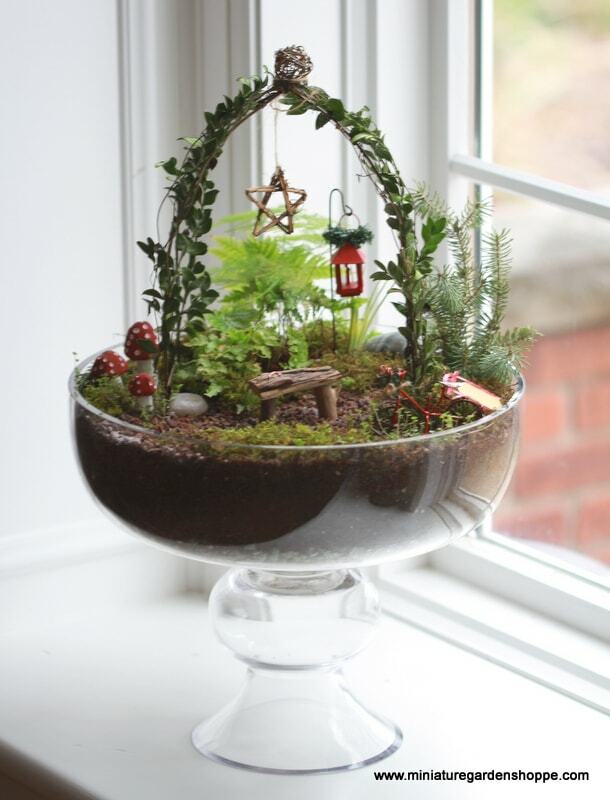 It makes it easier to bring your garden inside during bad weather as well. 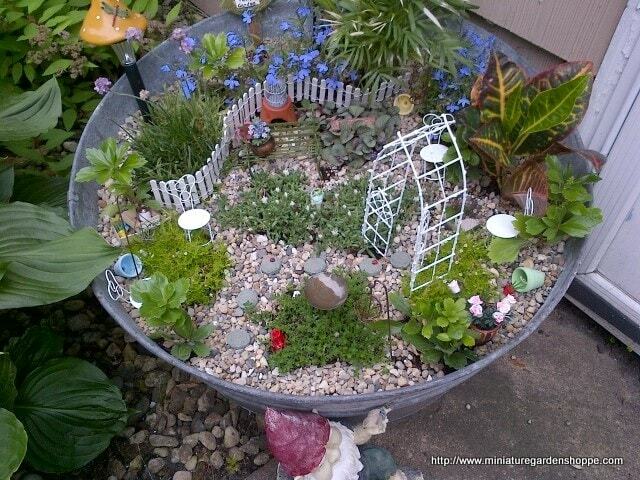 LeNore Murovic created a magical little fairy garden in a big metal wash tub. There is a nice balance between plants and accessories. Keeping the plants with the smallest leaves near the furniture and paths and the larger plants along the out edge, gives the garden a more realistic feel. The little blue lobelia flowers in the background are gorgeous – like little faces peaking over the fence. (by LeNore Murovic) The curved fence is a nice detail as it repeats the curve of the container. There are no straight lines in this round garden which gives it a very easy, casual feel and unifies the garden with a curvilinear theme. 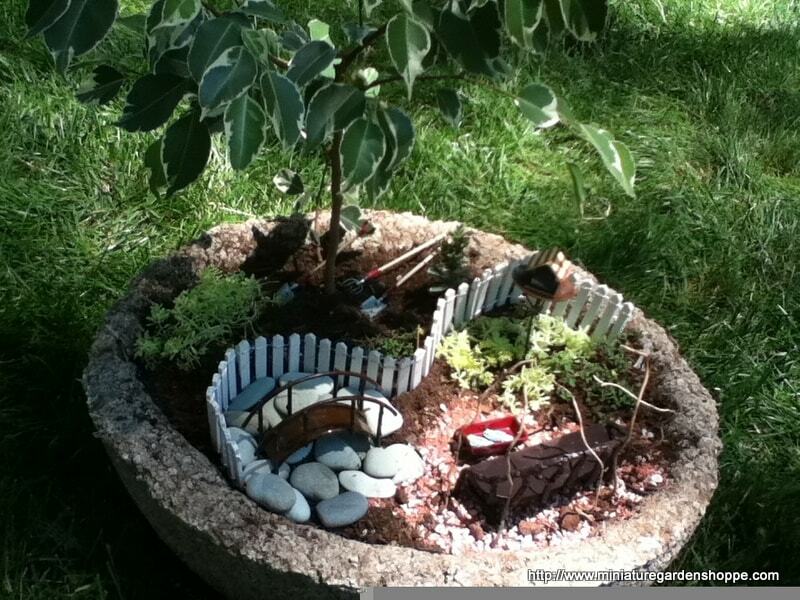 Miniature garden by 9 year-old Darby Carter, with a little help from her neighbor. 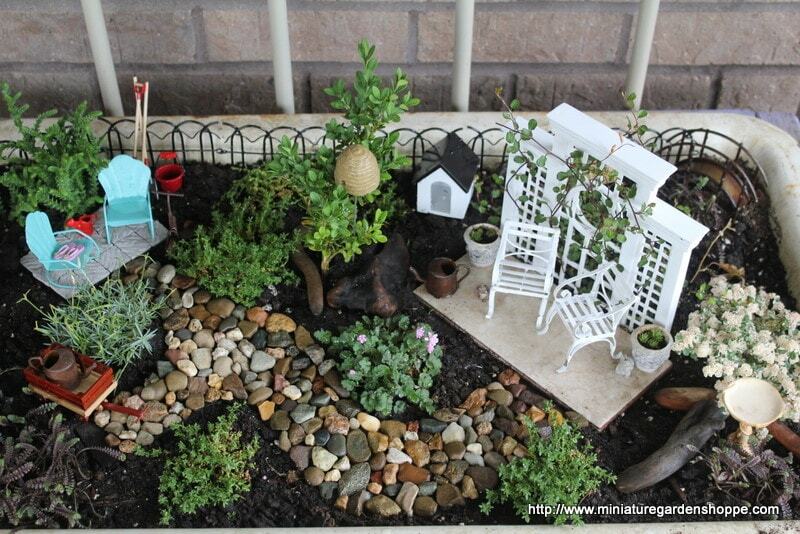 “We finally made our miniature gardens for this year and I thought mine looked sooooooo cute. So I just wanted to send you a picture of it so you could see it.” Darby does a great job of creating a big garden in a little space. 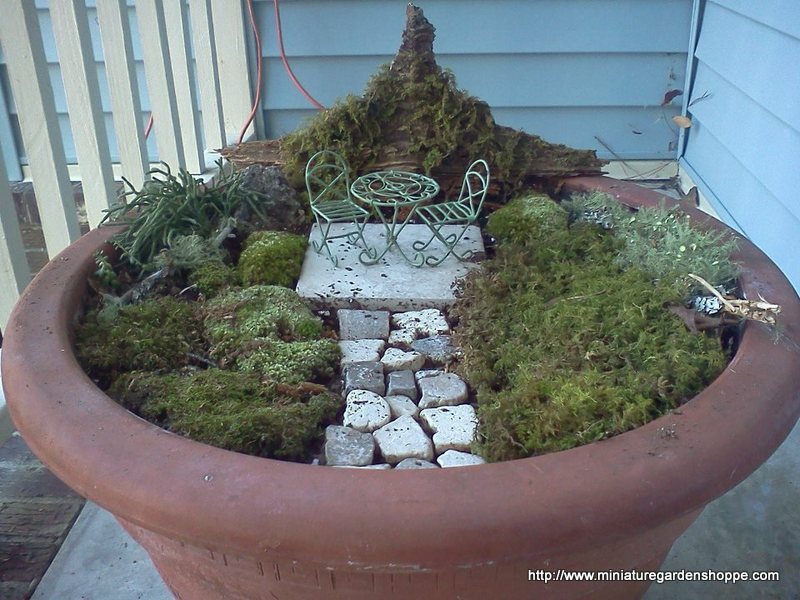 She used a birdbath to hold her birdhouse up high and a few twisty willow tips to create a little wall behind the bench. 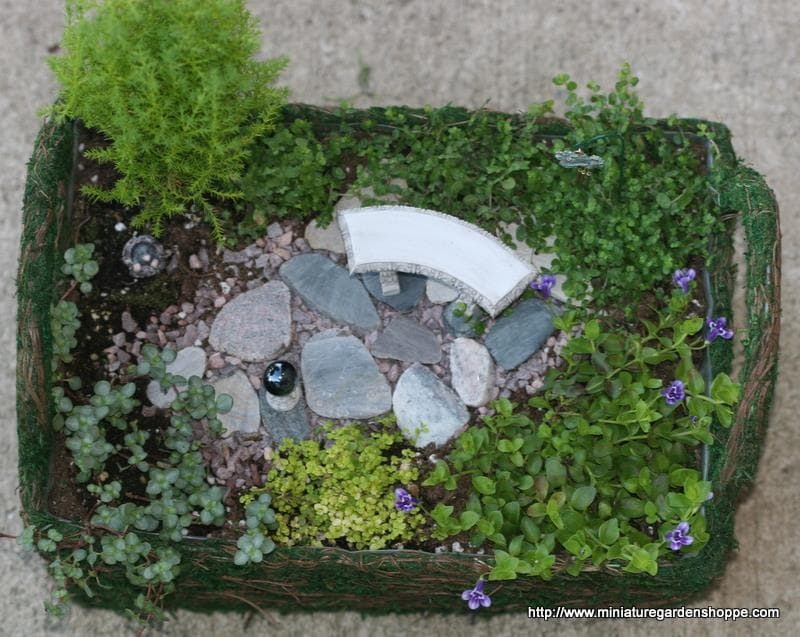 A serene little garden filled with bits of nature, created by Jennifer Holstein. Different mosses in shades of green make a beautiful groundcover. The old piece of wood draped with moss makes an ideal backdrop for the little patio. Interesting sticks look like old logs in the miniature setting. 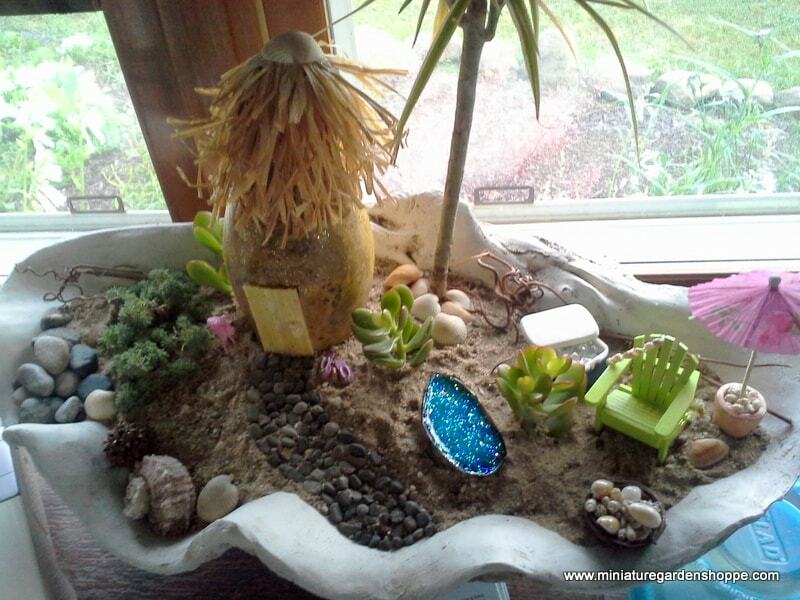 A wonderful way to bring nature home..
Beach garden by Irene Stenger: (from an email) “I've had the mini palm trees and cactus for a while and the spider plants as grass are cuttings. The lifesaver is a Lifesaver mint that I painted with permanent marker. The open gate was a last minute idea as I was putting up the fence. The other pieces (umbrella, towel & log) were added as I went along with the project.” Beautiful work! 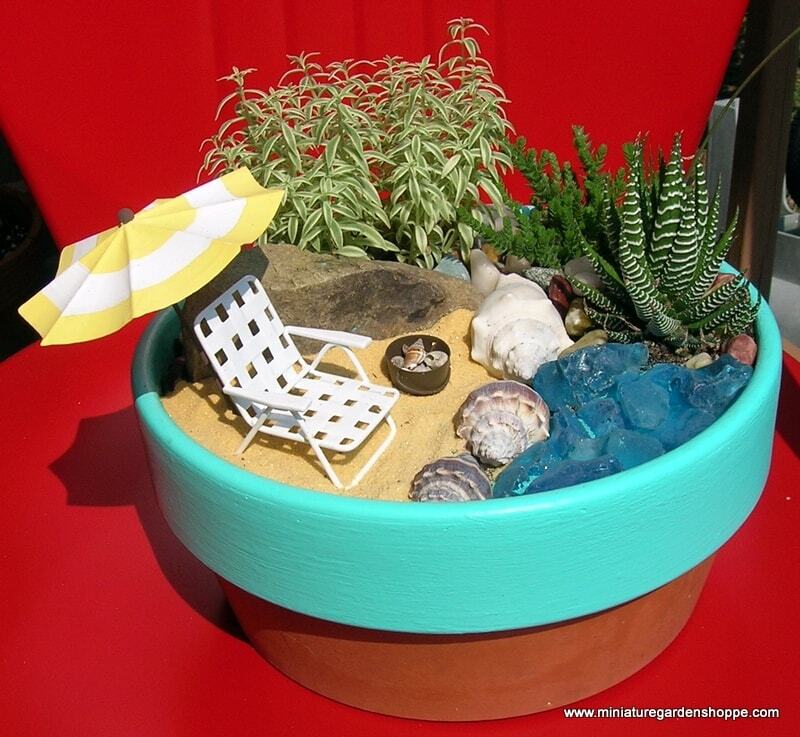 The blue bucket makes the perfect container for this little beach garden by Holli Risvold. The blue contrasts with the plants and yellow chair for an eye-catching design while the casual style matches that of the beach scene. The “beach” is authentic, borrowed from Huntington Beach nearby. 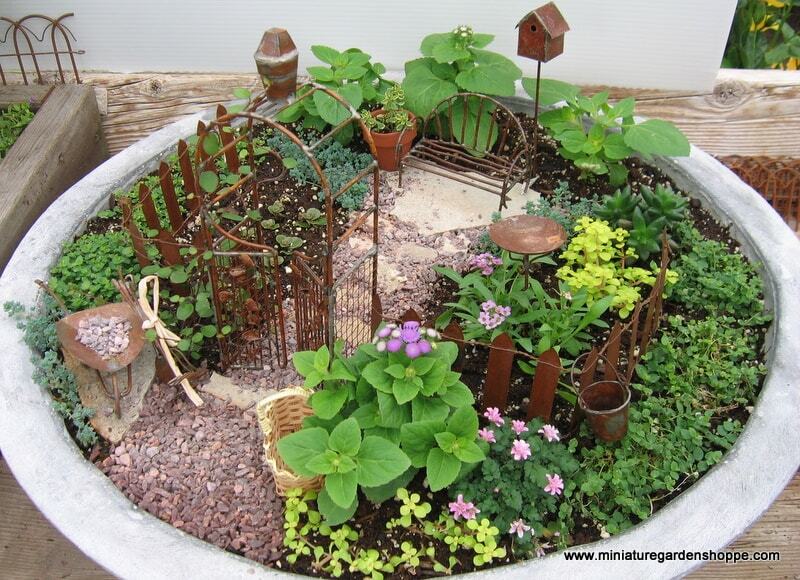 A picture perfect little garden. 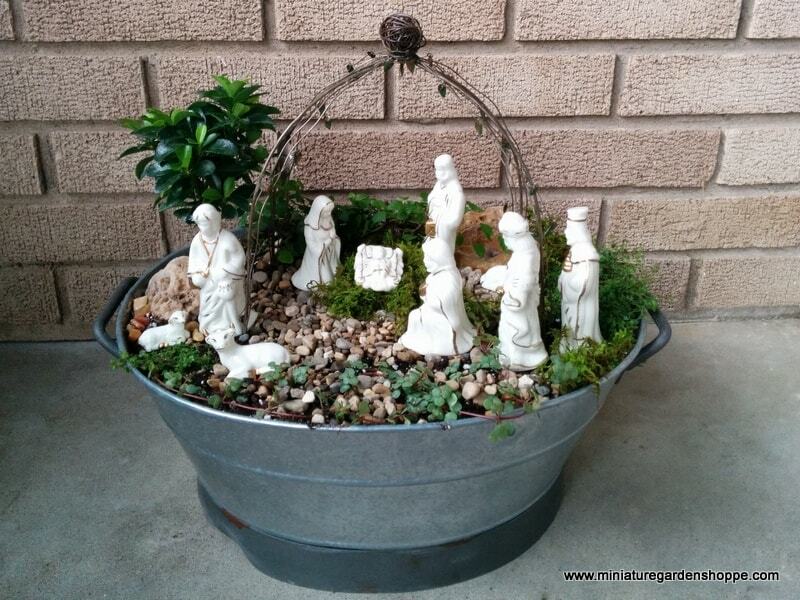 Learn how to create your own Easter themed garden just like the one below. 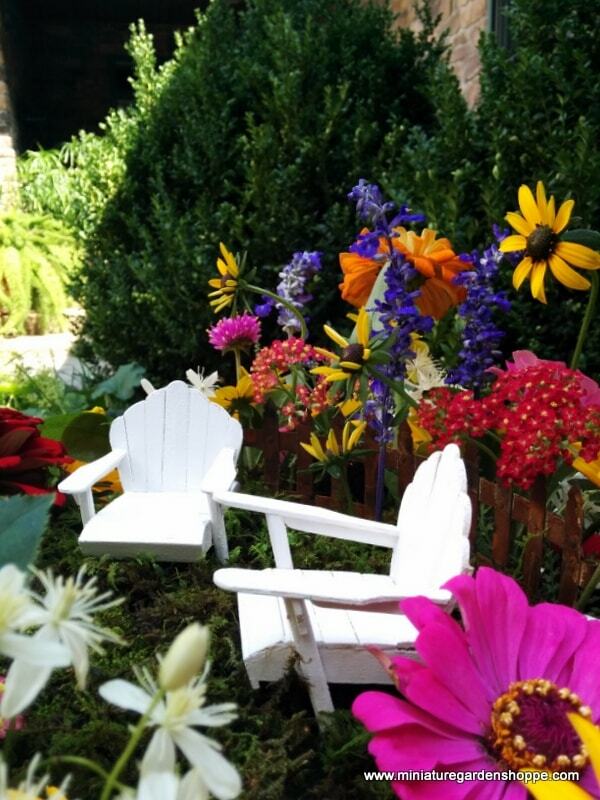 Use pastel colored furniture and accessories to create a springtime Easter garden. A quick coat of spray paint, like on this Traditional Birdhouse, can update any accessory. Add a little ribbon and the Summer Straw Hat turns into an Easter bonnet. 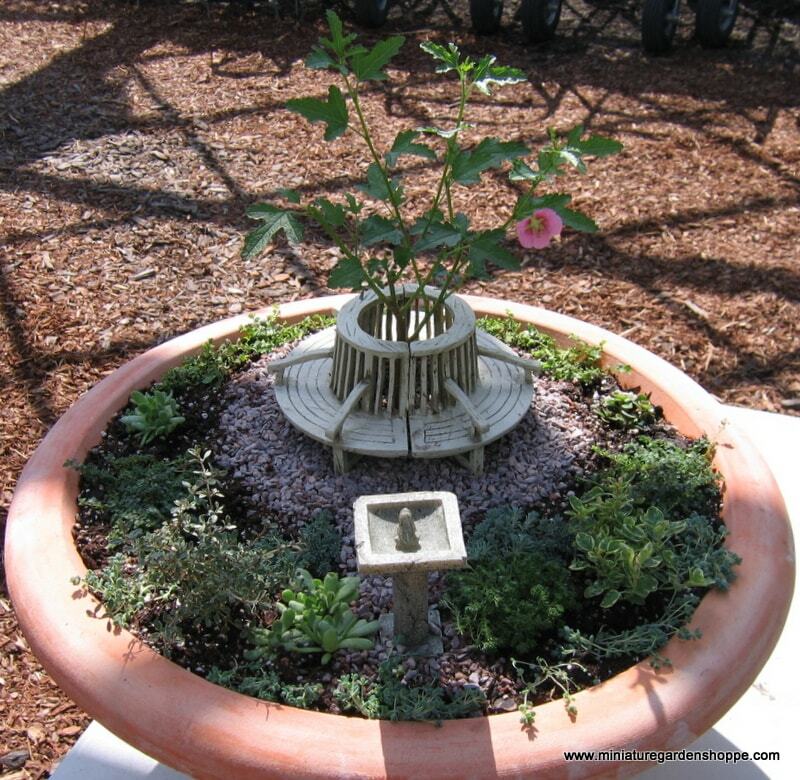 A garden that will be used as a centerpiece needs to look good from all angles. 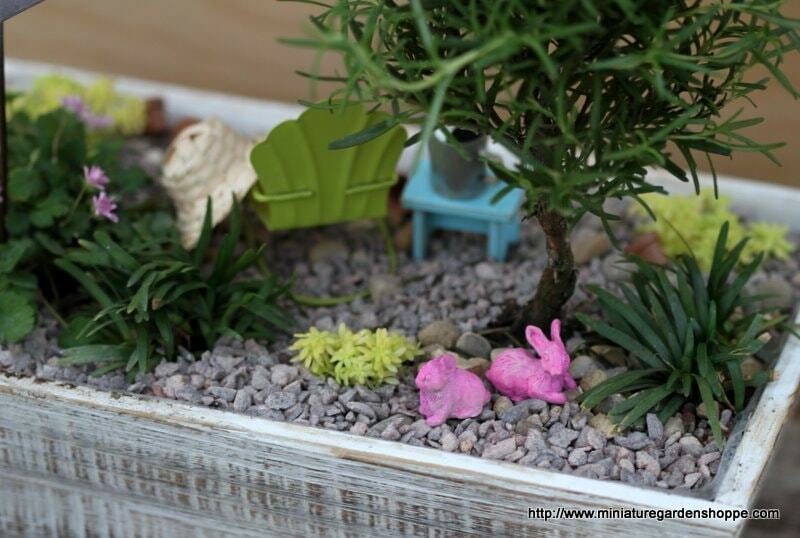 These hot pink little bunnies (spray painted Stone Bunnies) make a cute little focal point on the backside of this Easter garden. 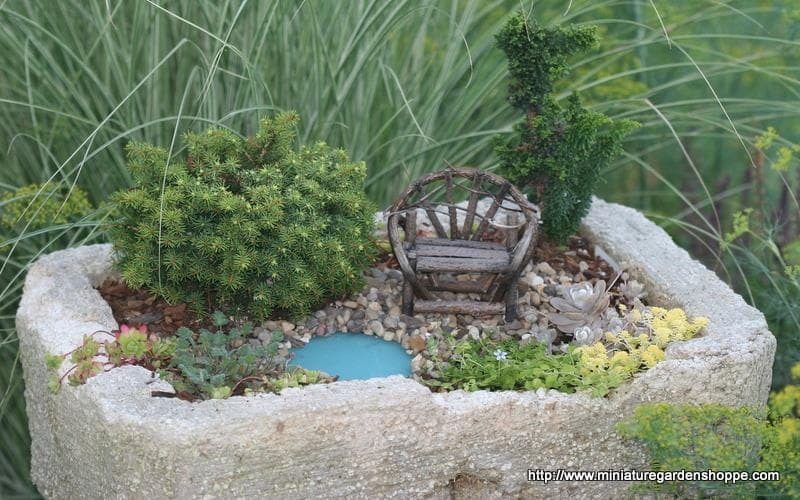 A miniature garden out in my backyard garden. 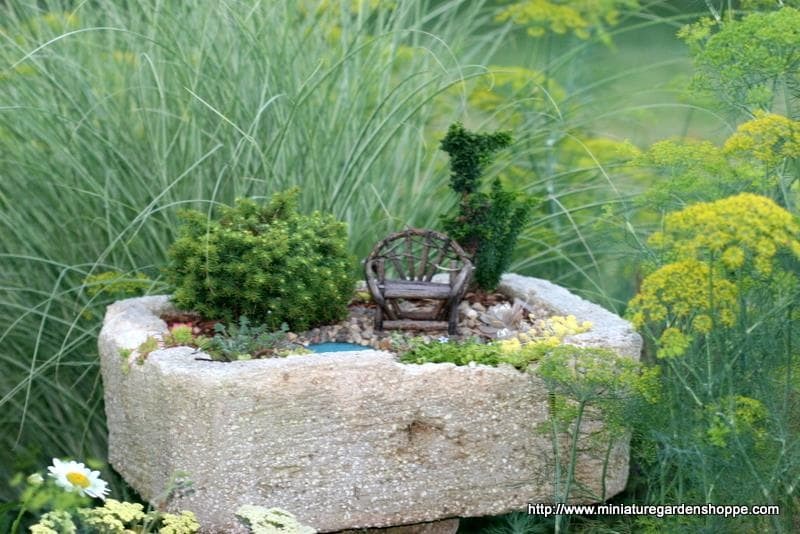 Placing a miniature garden on a pedestal helps to make it standout in the landscape. 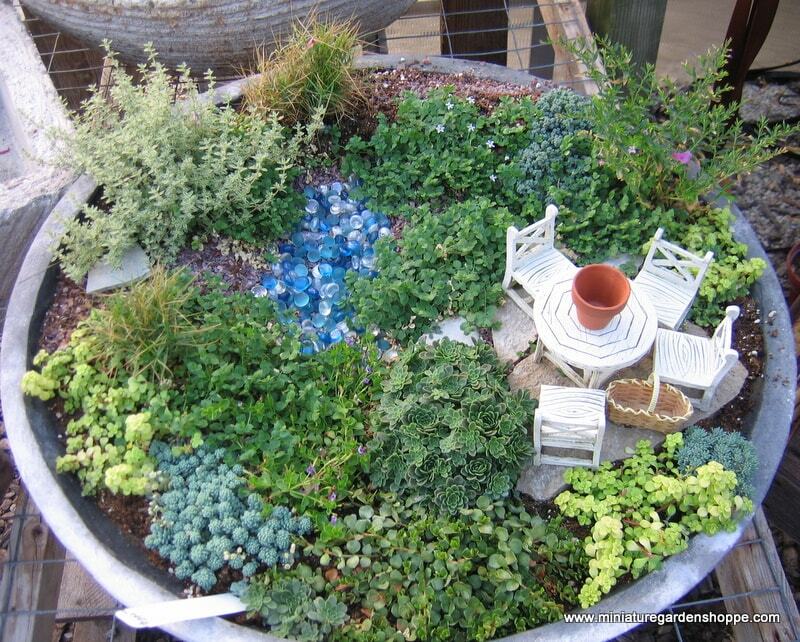 Always place a pond at the lowest elevation in a garden - just like you'd find in nature. Stepping stones are laid on a diagonal to create visual rhythm. Placing a plant at the beginning and the end of the fence anchors it in the garden and softens the transition. Placing the windchimes in the last link of the white scallop fence helps to keep them upright and makes good use of that last little loop. The white trellis makes a nice backdrop for the patio in a very narrow space. Flanking the seating area with two different "shrubs" gives it a formal look without being boring. Garden and design by Doris Gardner. 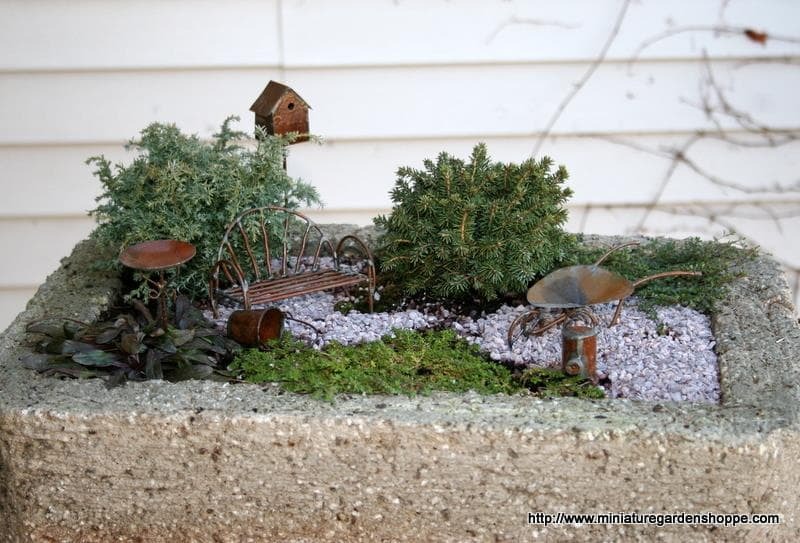 She had the clever idea to use a copper plant label from her perennial garden to create a "Grandma's Garden" sign for her miniature landscape. Using the fence across the middle of the container creates two garden rooms. Matching pots at either side of the gate emphasizes the entrance. The nice wide lip of the pot encloses the garden in color. 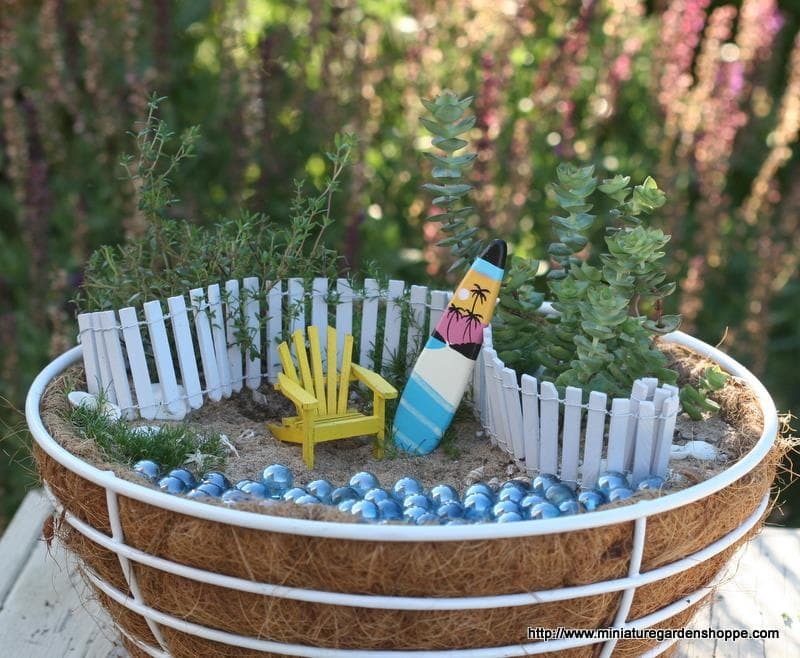 Baskets make great containers for miniature gardens, but covering up the edge of the liner can be tricky. Here we've used a combination of Spanish moss and low growing sedums to disguise the plastic lining. Layering broad pieces of flagstone is an easy way to make steps or terraces. 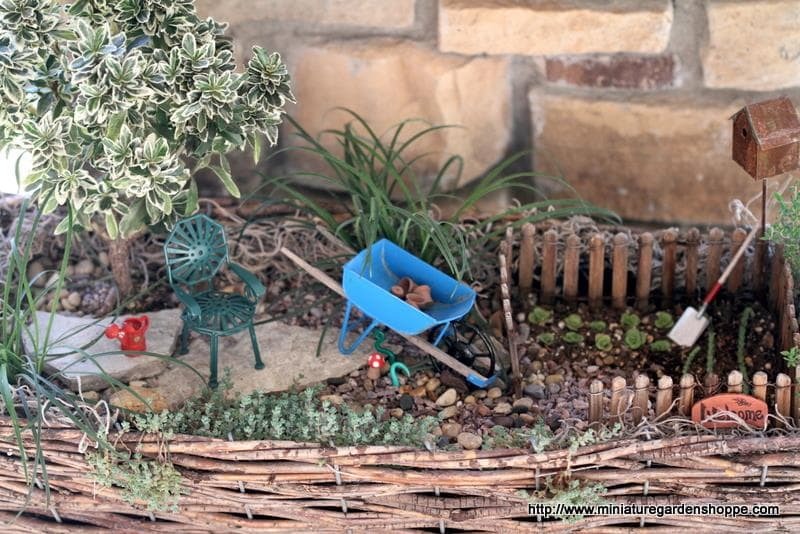 This designer uses a fence and the back of the garden and the beginning of two little stepping stone paths at the front of the garden to give the illusion that this little scene continues and this vignette is just a piece of a larger landscape. This little garden was nicely coordinated with pleasing colors and textures, but something was missing. The addition of the friendly dog and two antique pots makes the garden more dynamic; giving it a stonger focal point and tying the two areas together. This garden had the same problem. The design is good, but the scene is just not that interesting. Adding a centerpiece to the table makes the entire scene complete. 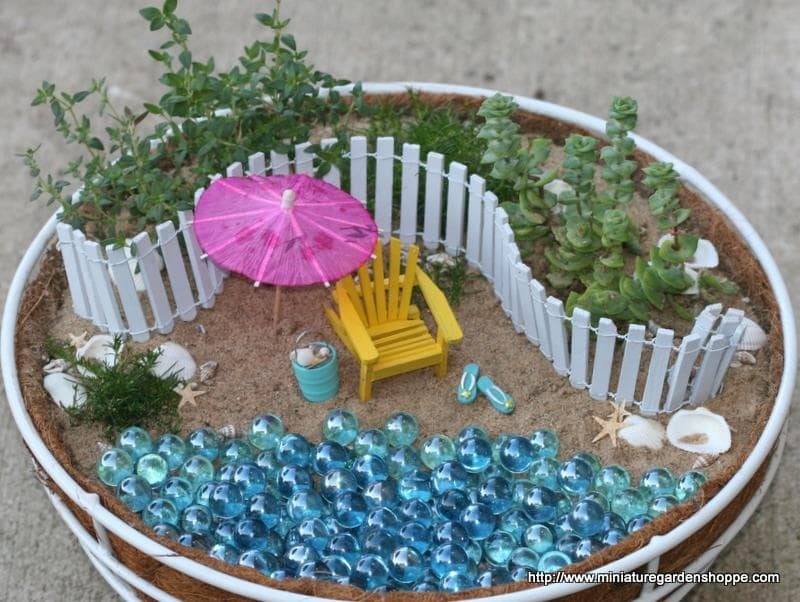 I helped this Illinois gardener to create her own little piece of beachfront. She's going to enjoy it at home while dreaming of the day she can retire to Florida. The shells and coral were collected while on vacation. 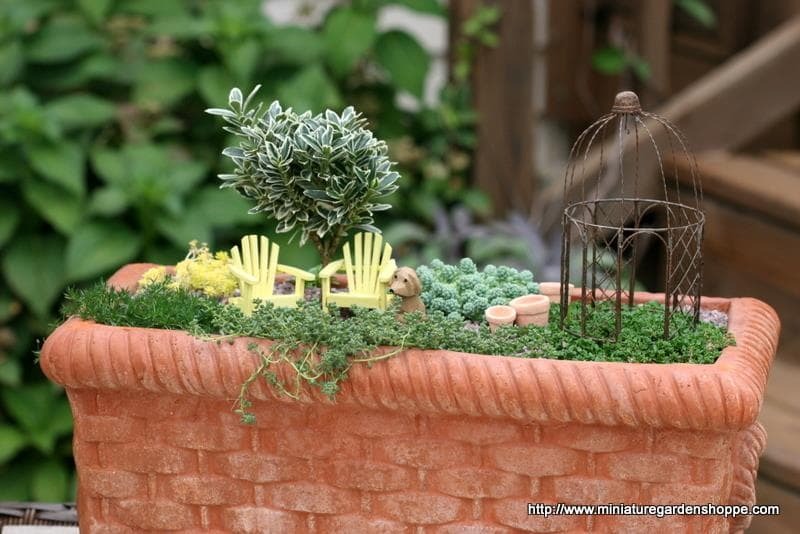 Use larger growing plants at the edge of a garden where they can spill out instead of crowding inside. 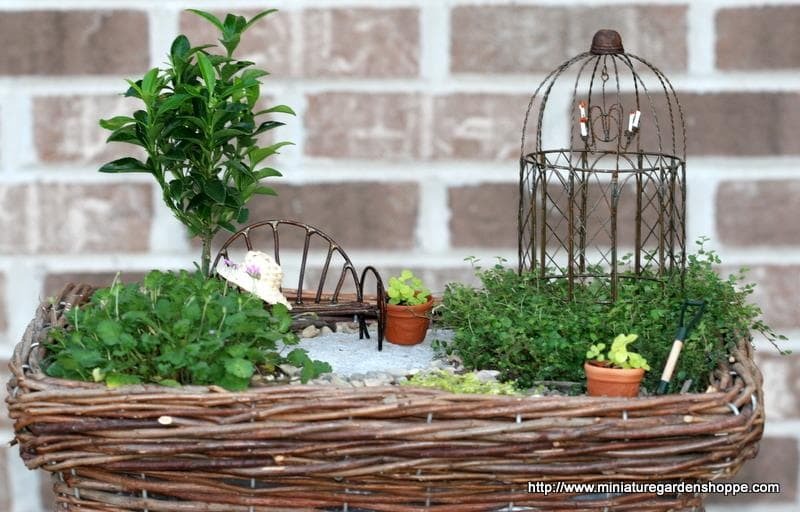 Cocoa baskets look great as miniature garden containers, but are not practical if the garden is to stay indoors for the winter. Notice the English thyme in the back left corner. It was pruned (and sprinkled on grilled tomatoes) just before the picture was taken. 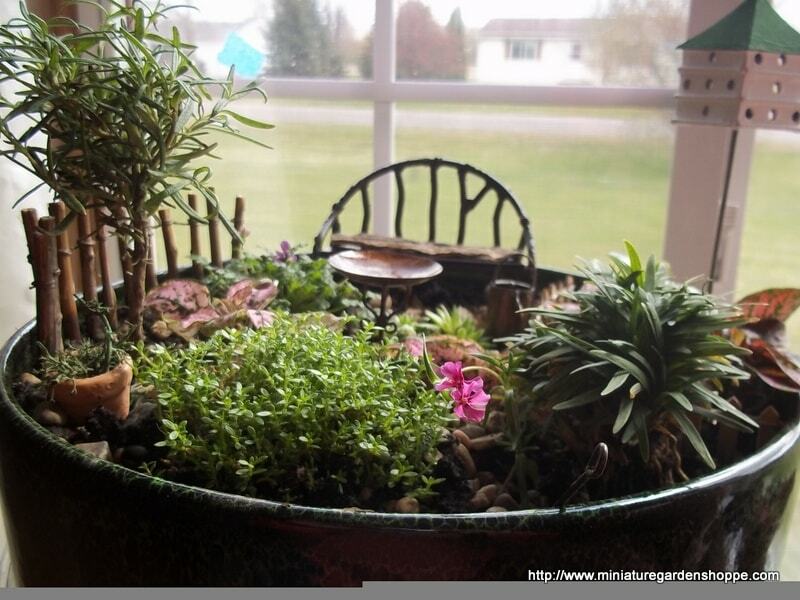 Don't be afraid to cut plants back when they out-grow their space - it is an important part of miniature gardening. The same garden earlier in the season, with a few different accessories. 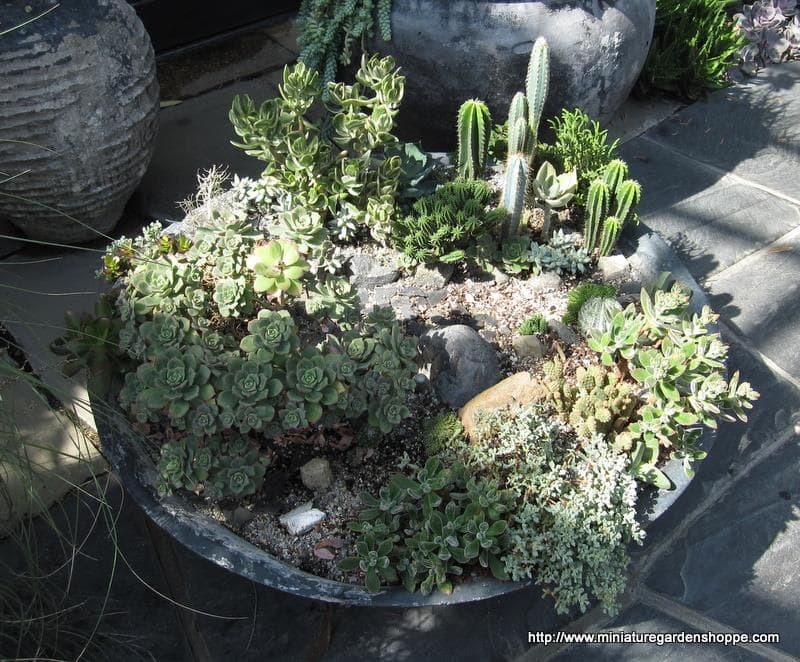 With a little bench, a few pots, and miniature garden tools, this beautiful container of succulents and cacti at Longwood Gardens could be an amazing little landscape. The rocks make awesome scale boulders. (Close-up of the previous garden.) The use of contrasting forms (round, vertical, spreading), textures (smooth, spiny, broad, divided) and colors (olive green to blue) is exactly the same in "real" landscapes and miniature ones alike. 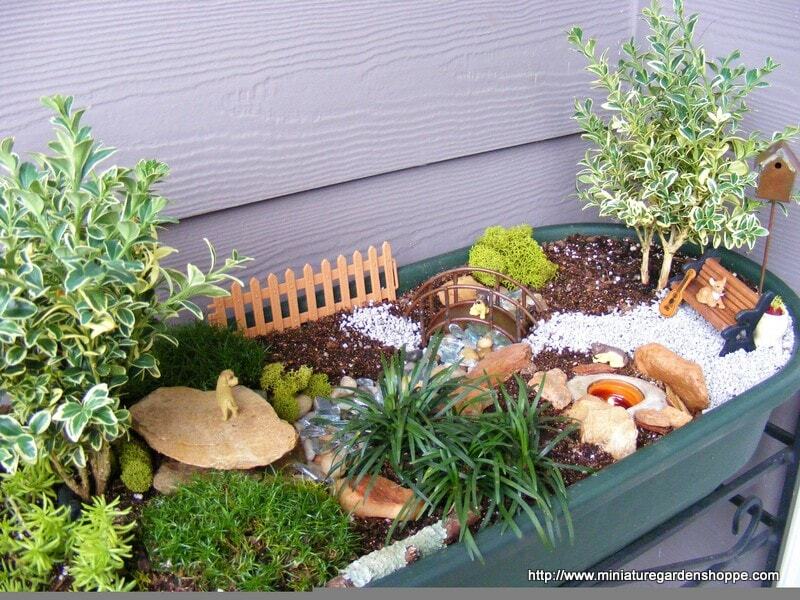 The better the use of these elements, the more realistic the miniature garden. Garden and design by Carol Davis of Washington. The container is an old wheelbarrow and she raised it up on blocks to be more easily maintained and viewed. The voids of the blocks make great additional planting spaces - a true gardener leaves no hole unplanted! 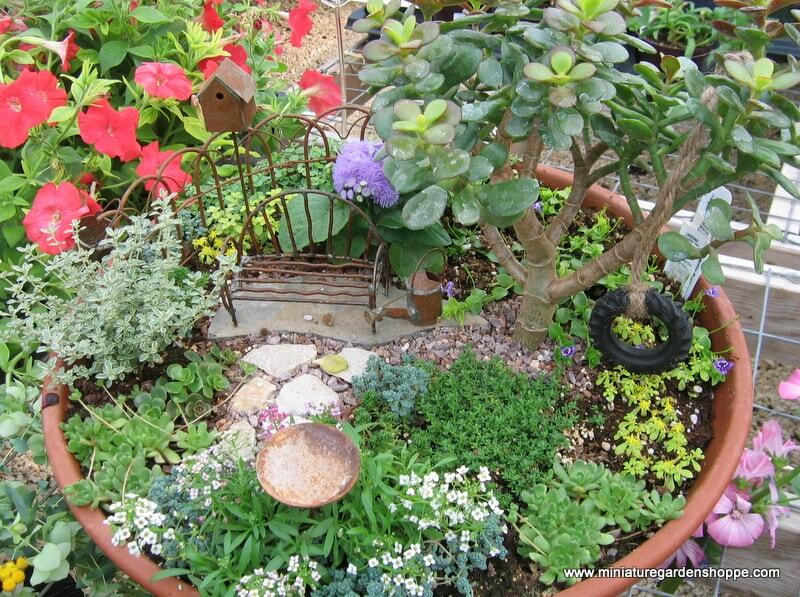 Instead of trying to plant in a tiny decorative urn, Carol used it as the base for a mini red "gazing ball" (upper left-hand corner of patio). A good design, like Carol's, places a focal point at the end of every path. Carol glued rocks to a piece of plastic edging to create the retaining wall. Changes in elevation make a large miniature garden more interesting. Not every beach or waterfront is all sand. Mixing rocks and sand provides interesting textures and added realism. 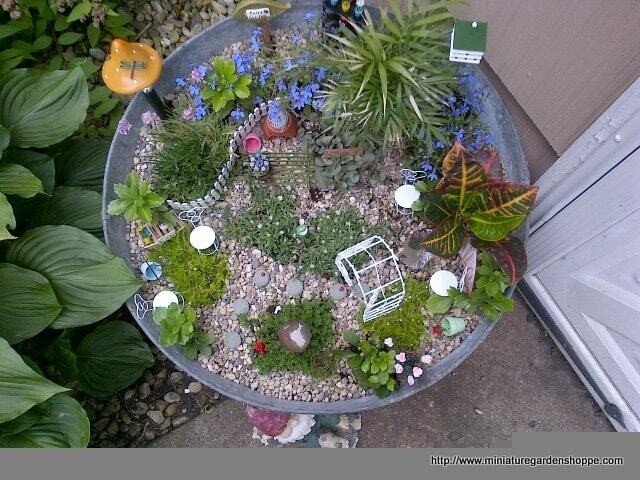 This garden would be even more interesting with a few larger rocks mixed in. Place a set of windchimes, a birhouse, or a hummingbird feeder in a "bed" of low growing plants makes it standout in a landscape. For example, the same windchimes shown here would be lost if an English thyme "shrub" were planted right behind it. A simple design that works well for a small garden. An ideal arrangement for an indoor window, office desktop, or a hospital bedside. Sometimes it can be fun to have the focus somewhere other than the front of the garden. 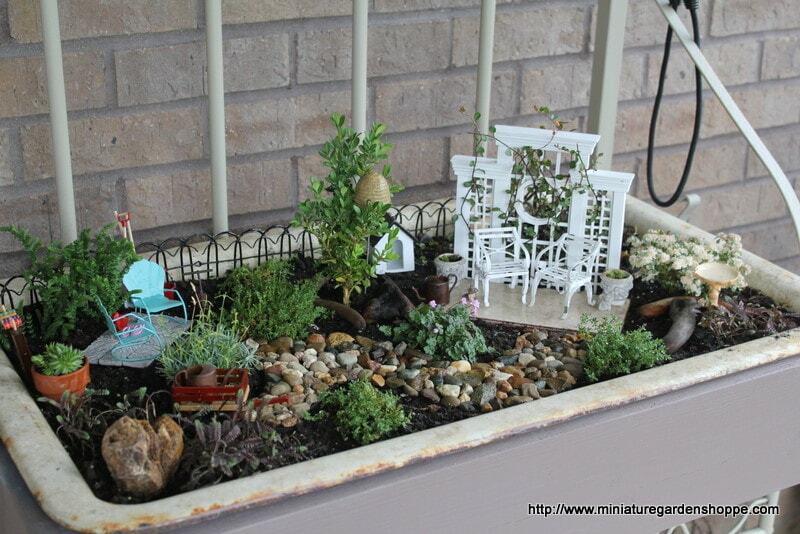 Here the bench, path, and accessories all lead to the side of the planter. The viewer (from the front) the feels as if they are peaking into the garden world. 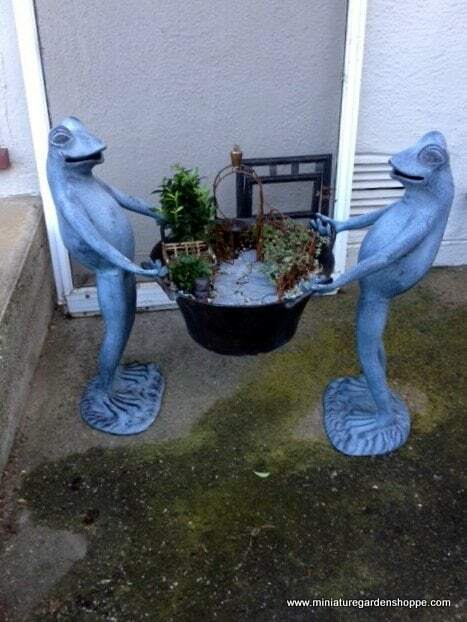 This can be especially effective for fairy gardens where humans should never intrude. 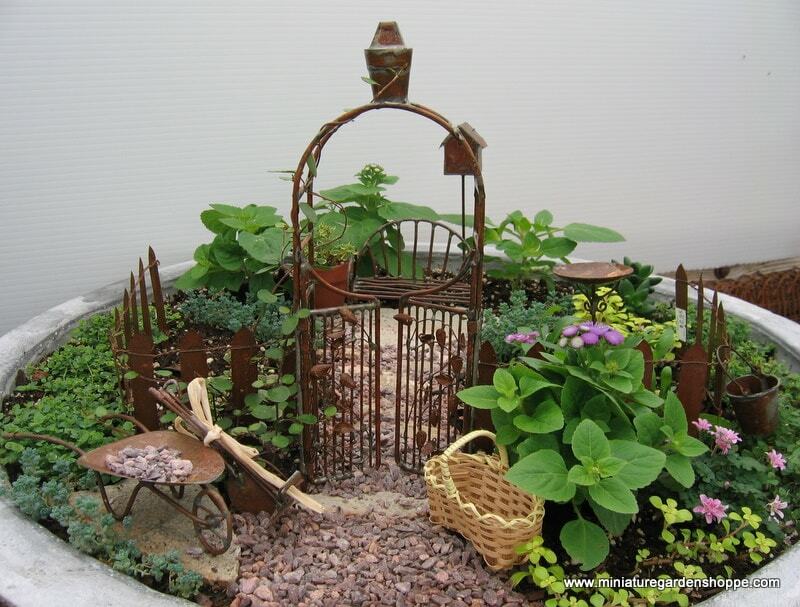 Garden and design by Monica Moreno of Quebec. Note her use of creeping phlox tip cuttings to line the pathway and stacked stones to create a retaining wall. 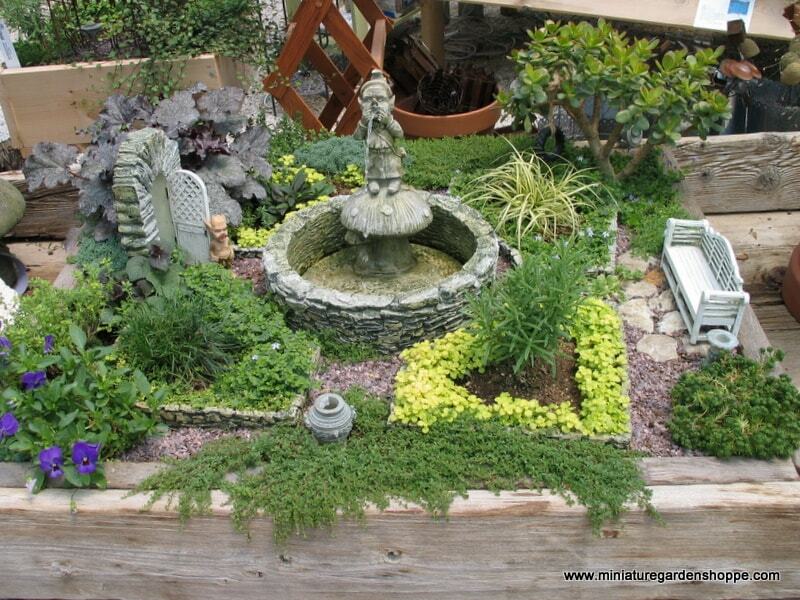 Garden and design by Monica Moreno of Quebec. A great use of stone in different sizes and colors to create garden beds and emphasize the pathway. The repetition of the curved lines creates a sense of unity in the design. Dwarf blue Ageratum looks like a blue hydrangea shrub. 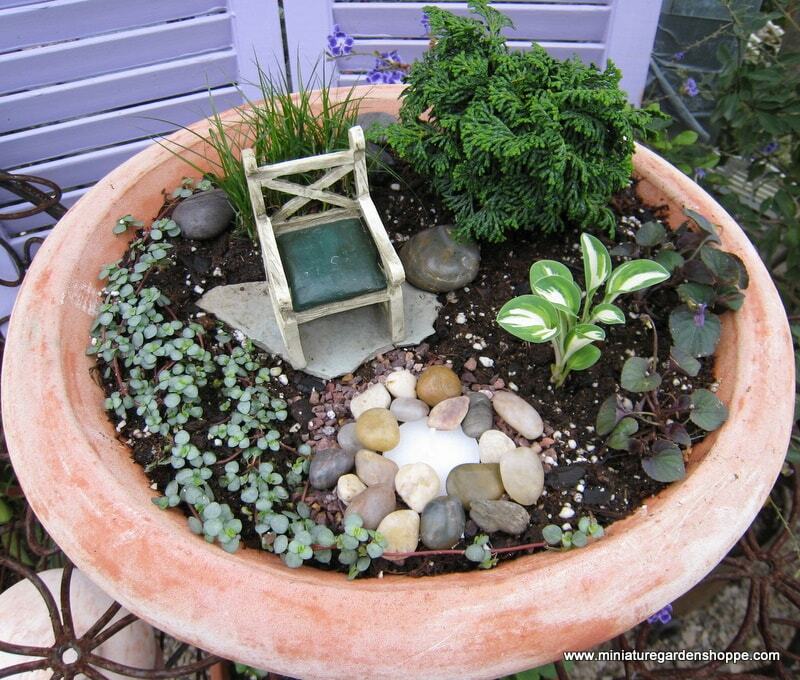 Place a wheelbarrow on a piece of flat stone to keep it level in the garden and to show it off. Decorate for the holidays. 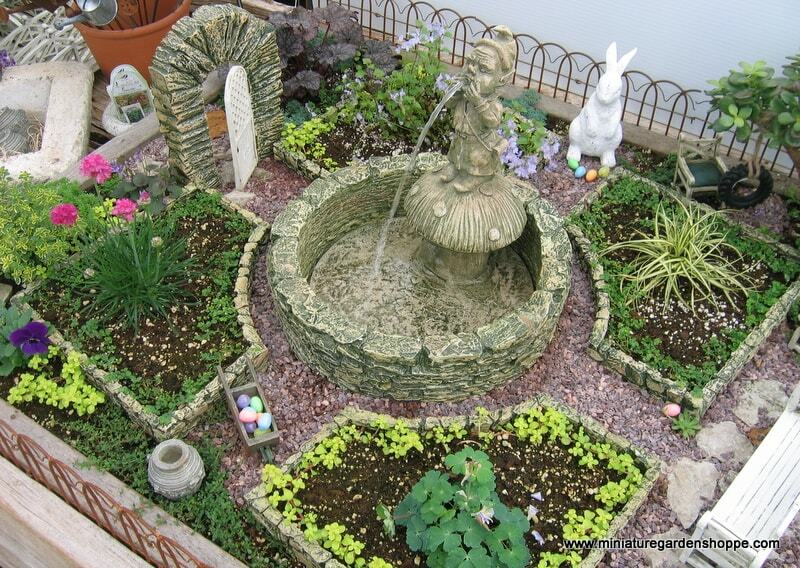 Little colored eggs and a bunny statue get the garden ready for Easter. 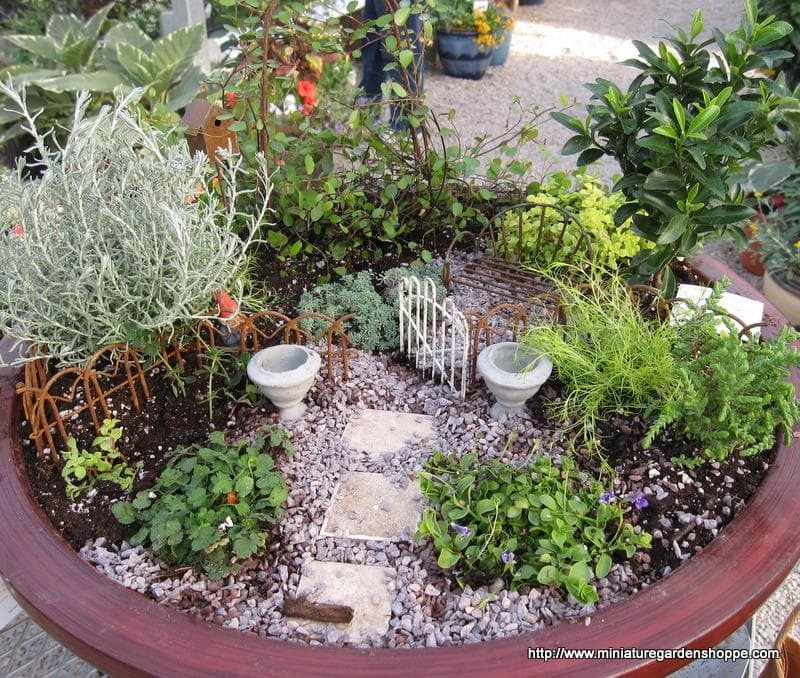 Small decorated gardens make unique centerpieces for the dinner table. 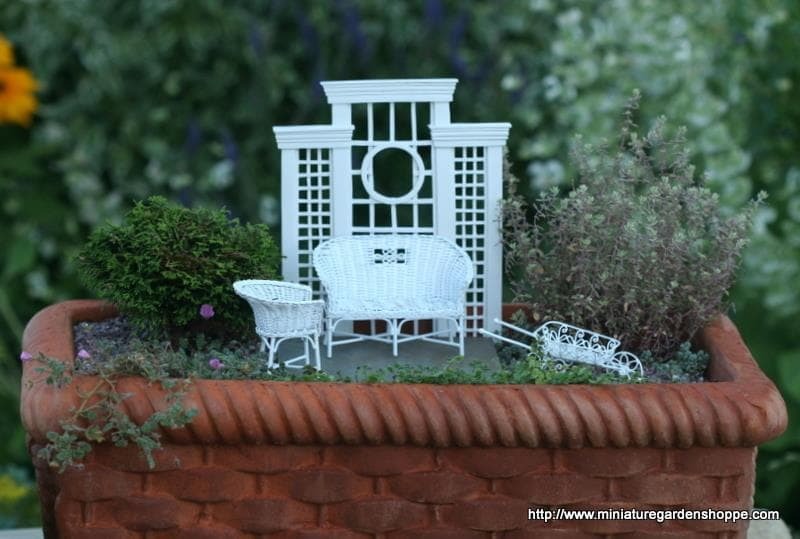 A miniature trellis makes a nice backdrop for a little patio setting. 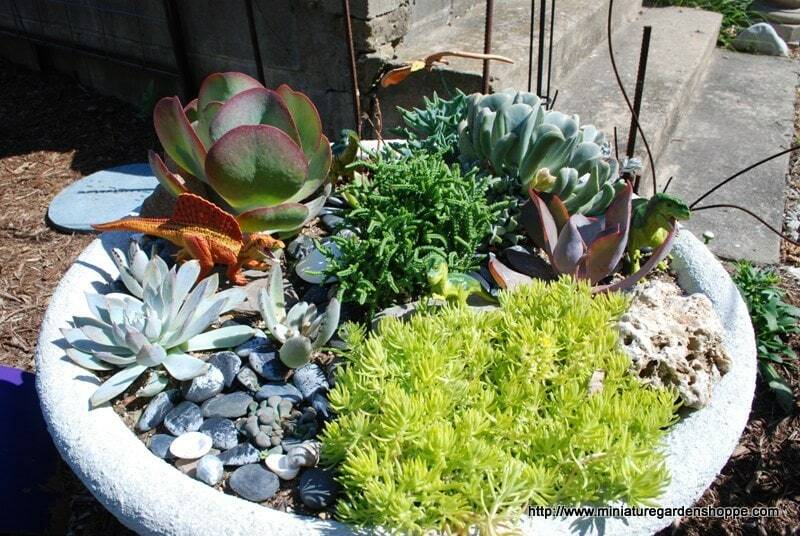 Succulents are great for planting in tiny pots. 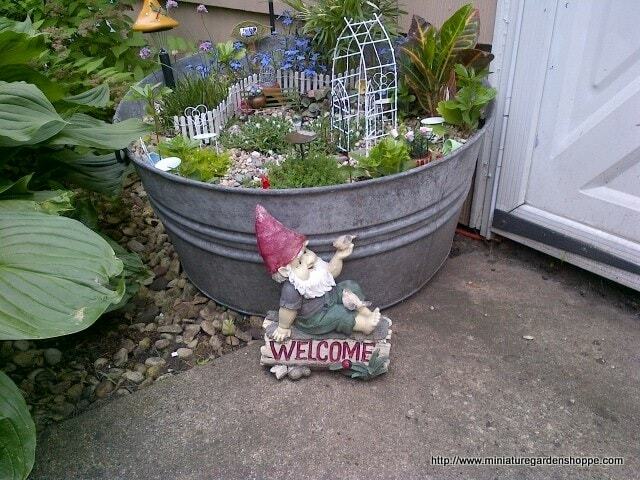 When using a filled bucket as an accessory in the garden, poke a hole in the bottom so water won’t collect in it. Two chairs fit nicely below the large rustic arbor to create a quiet little sitting area. 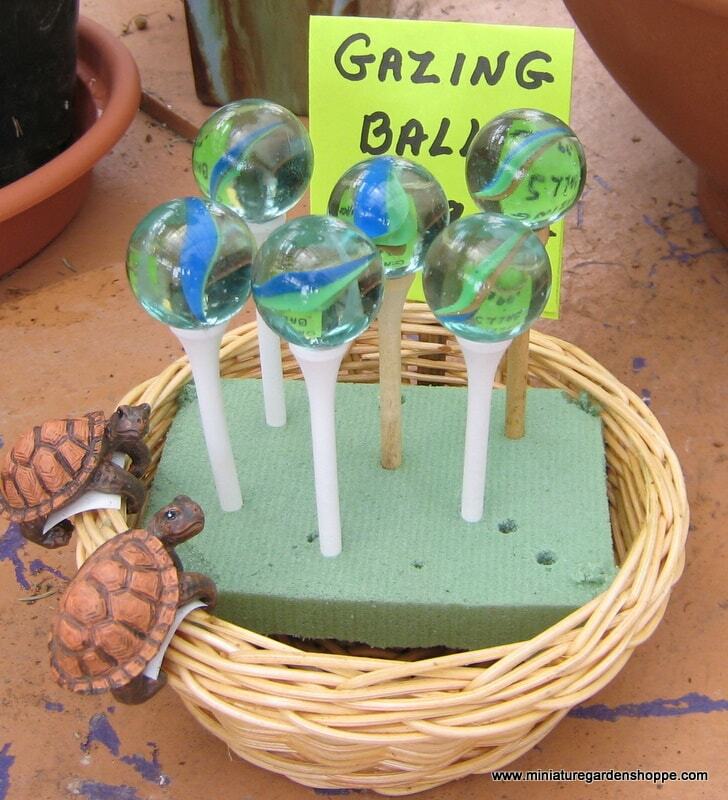 A simple gazing ball and stand. Paint a golf tee and glue a pretty marble on top. A path with mixed materials. Little landscape gravel before the arbor meets a broad piece of stone that works as a threshold. Inside the garden, flat little stones make the path with gravel in between. Another large stone sits under the bench, making the dark wire more visible. 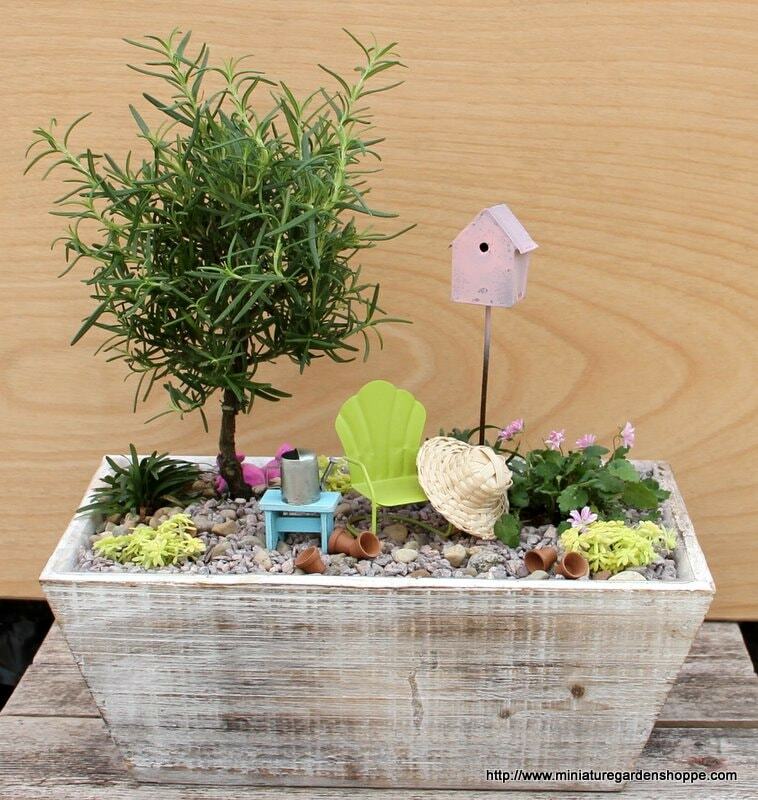 A faux bois planter makes a beautiful container for a miniature garden. A symmetrical design is very formal. Using a variety of plants keeps it interesting, not boring and predictable. An arbor can be an entrance to a garden or a nice backdrop, as in this garden. Note how the red chair echoes the red tones in the container. The birdhouse on a stick adds height to the garden. The rustic finish on the accessories, the birdhouse of natural brown materials, the red gnome, and the terracotta color pot combine to create a unified color scheme. The garden is full of whimsy and fantasy without being gaudy. 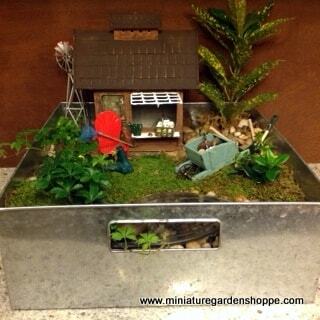 The gravel, plants, and birdhouse keep it natural. A big tree in the garden with a tire swing below and a bench nearby makes a perfect summer setting. 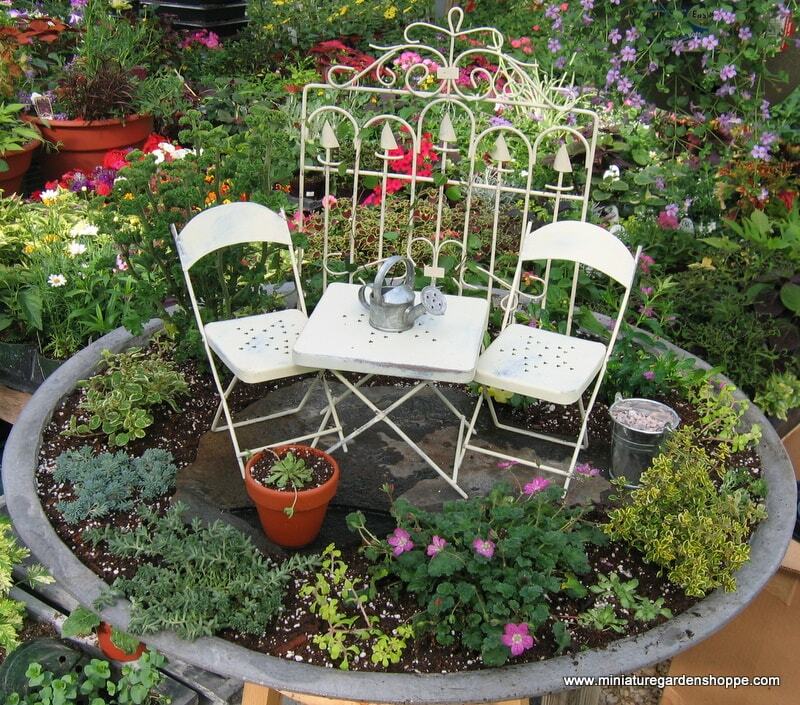 A variety of sedums and other little-leaf plants make a lush setting for the table and chairs. 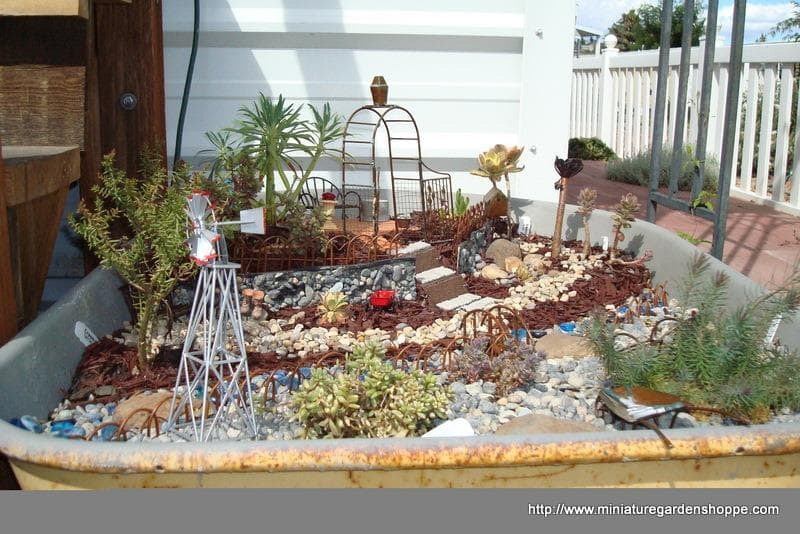 Miniature landscape can be just as elaborate at the real thing! 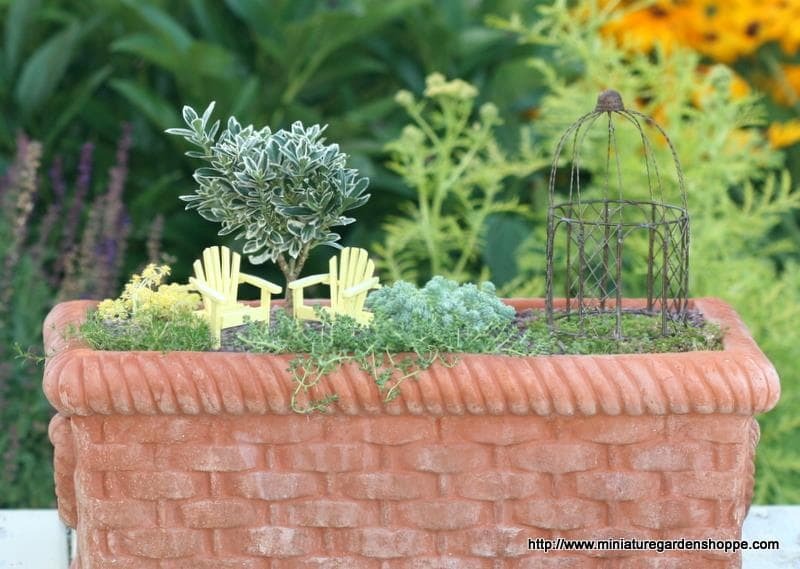 Two terra cotta bowls are stacked to create a two-layer garden. This arrangement works well for a centerpiece, as the garden isTwo terra cotta bowls are stacked to create a two-layer garden. 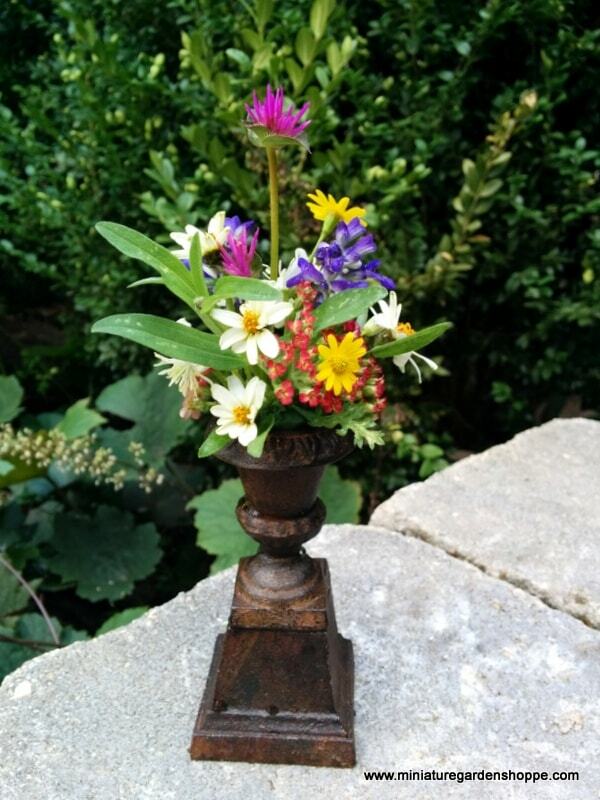 This arrangement works well for a centerpiece, as the garden is designed to be seen from all sides.